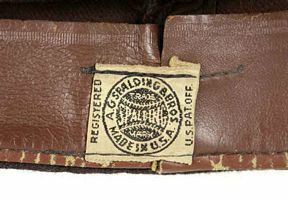 Used only at home in the 1917 Series. 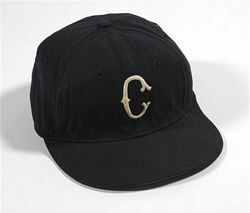 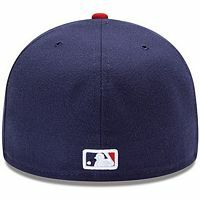 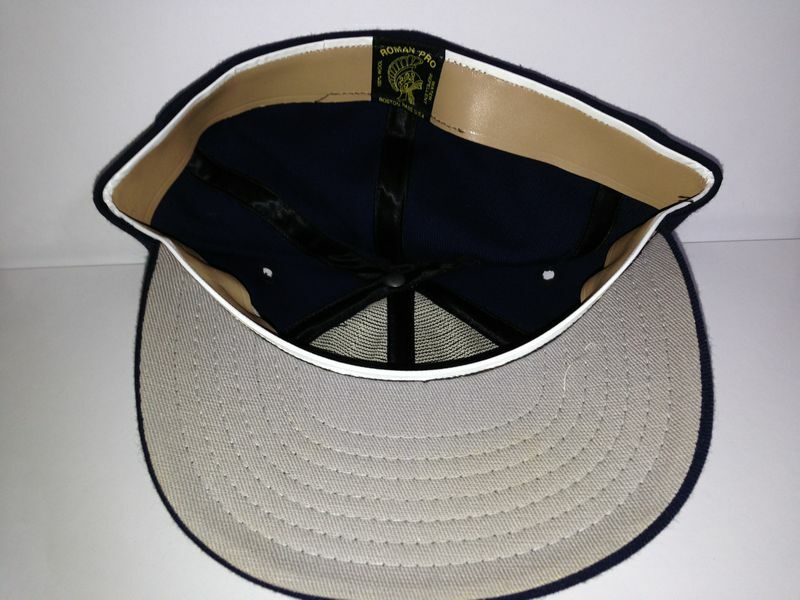 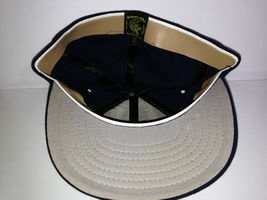 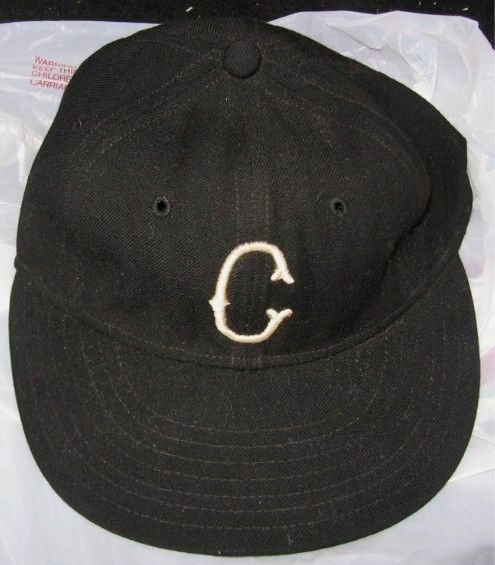 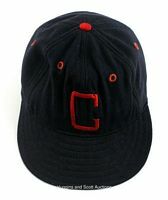 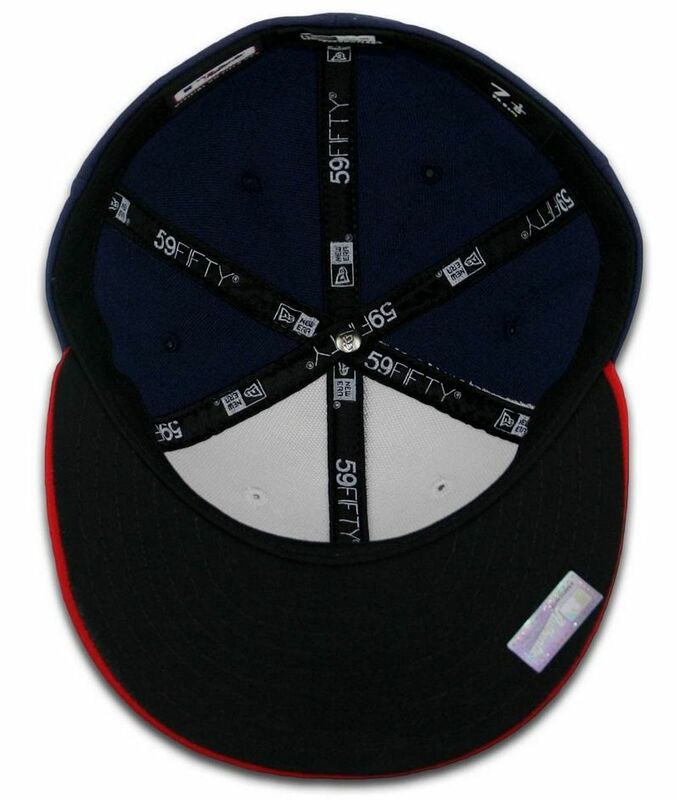 Navy cap with white tuscan "C"
Cap logo changes to a block "C". 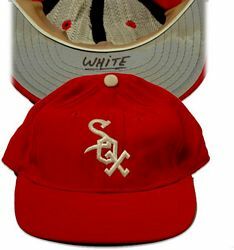 The HOF database shows white at home, red on the road, but all the photos I've seen show a red block "C" used home and road. "SOX" replaces "C" as the logo. 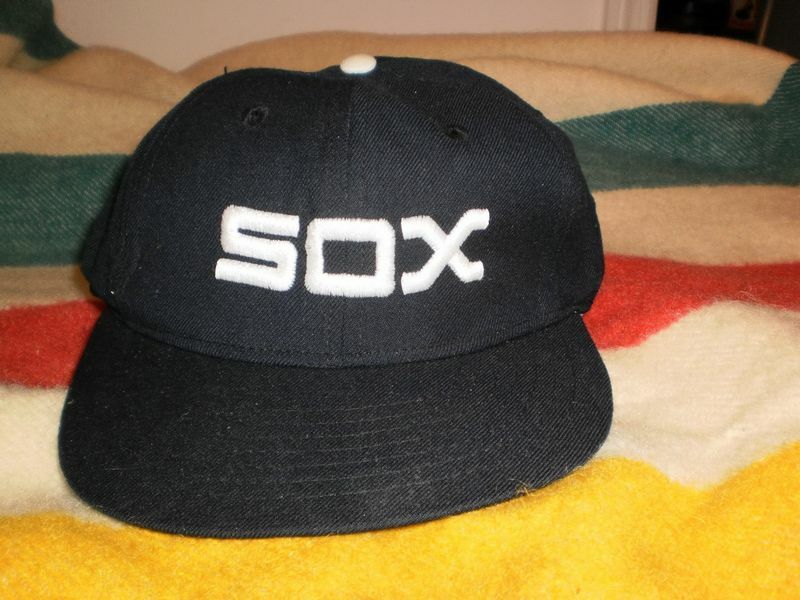 How many ways can you write the word "SOX"? 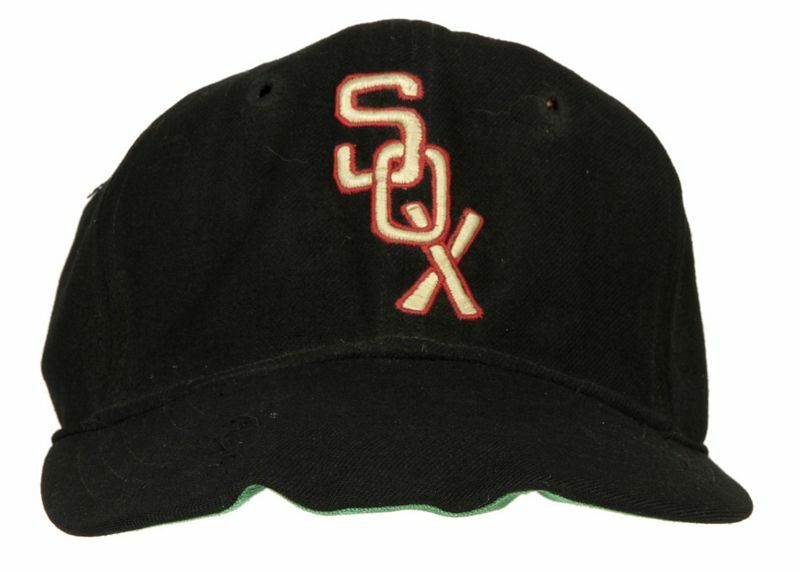 I count SIX (maybe SEVEN) different logo styles used from 1951-63! 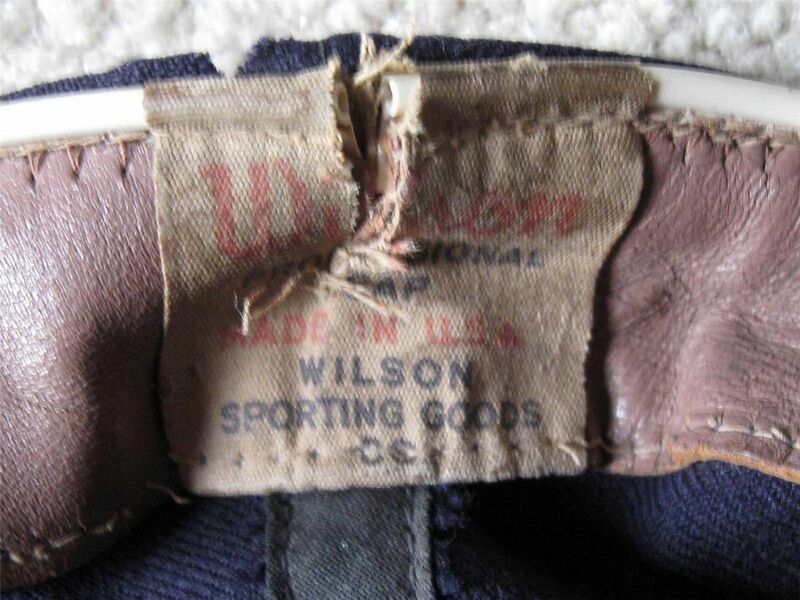 Wilson lettering has a stacked appearance. 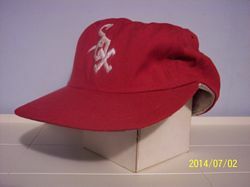 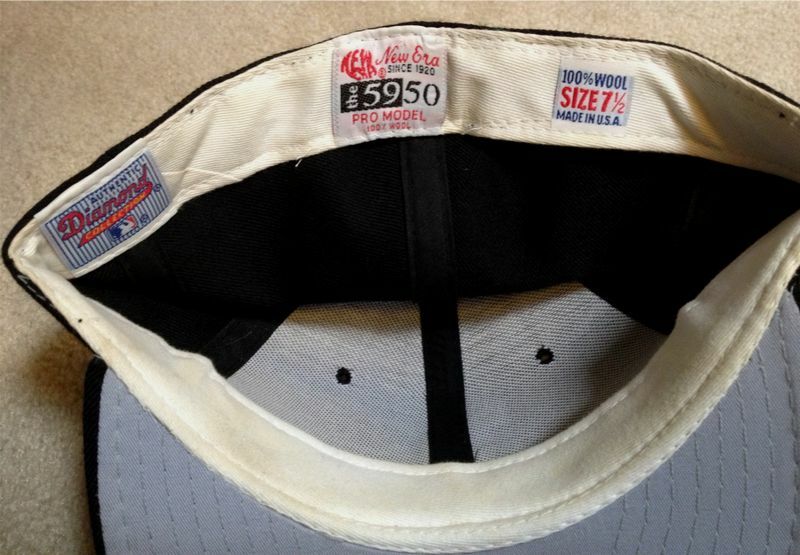 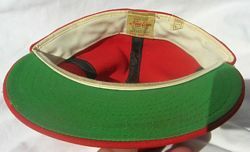 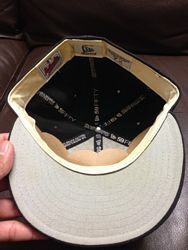 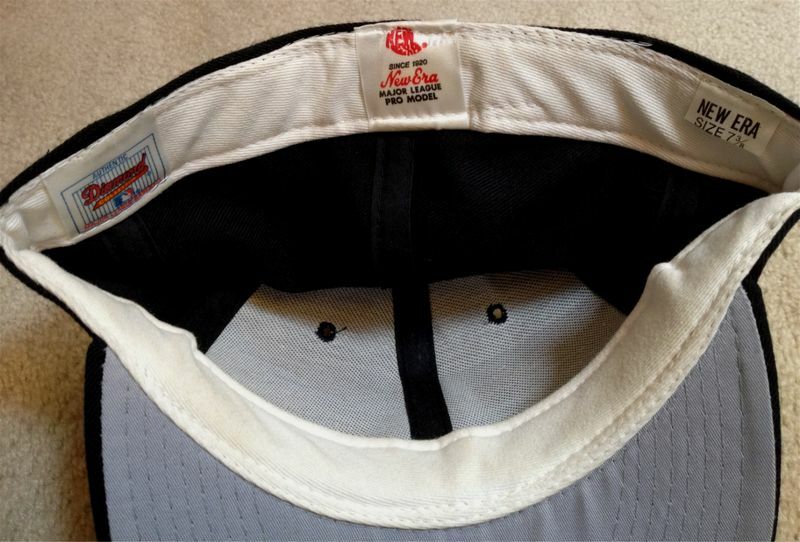 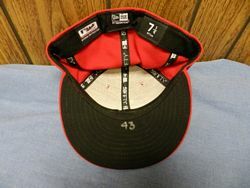 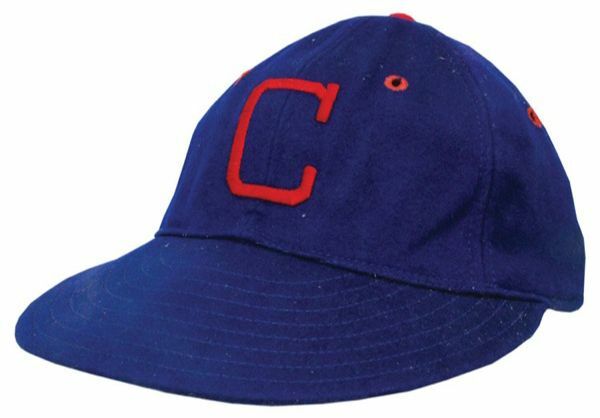 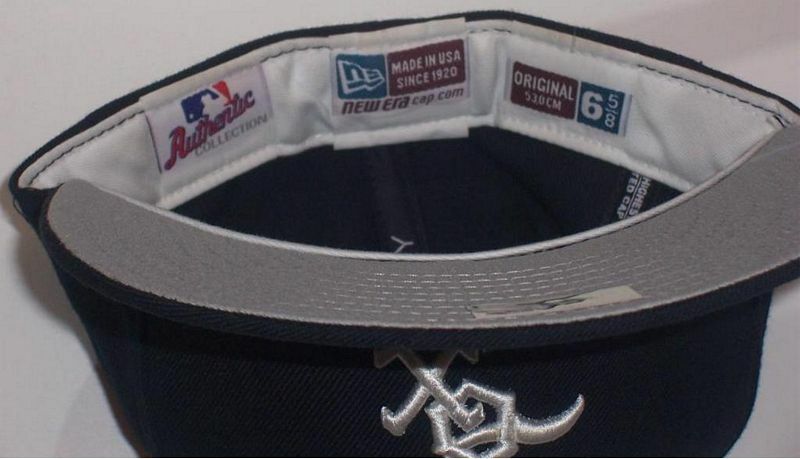 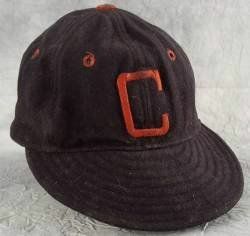 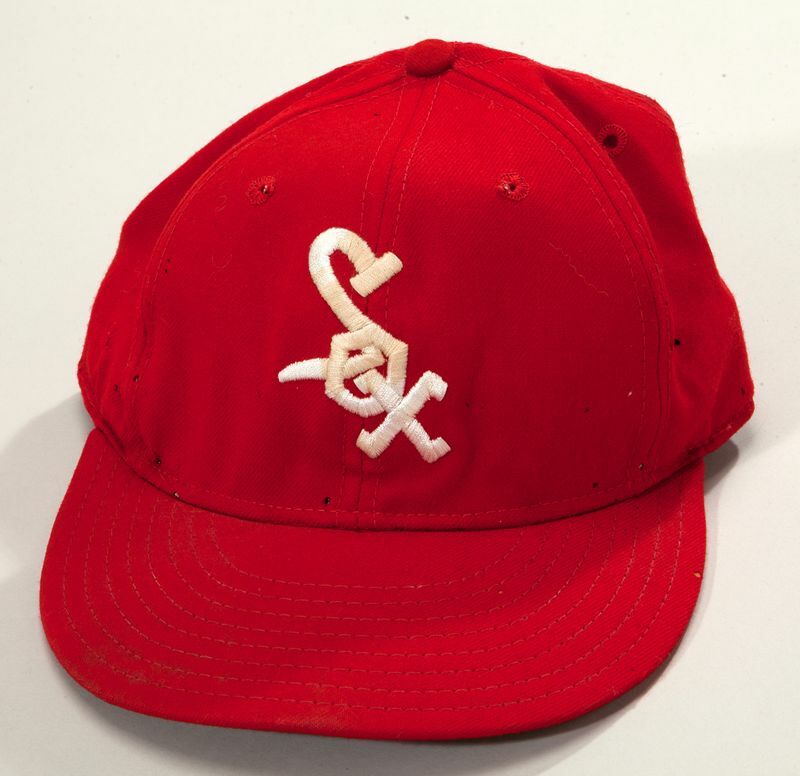 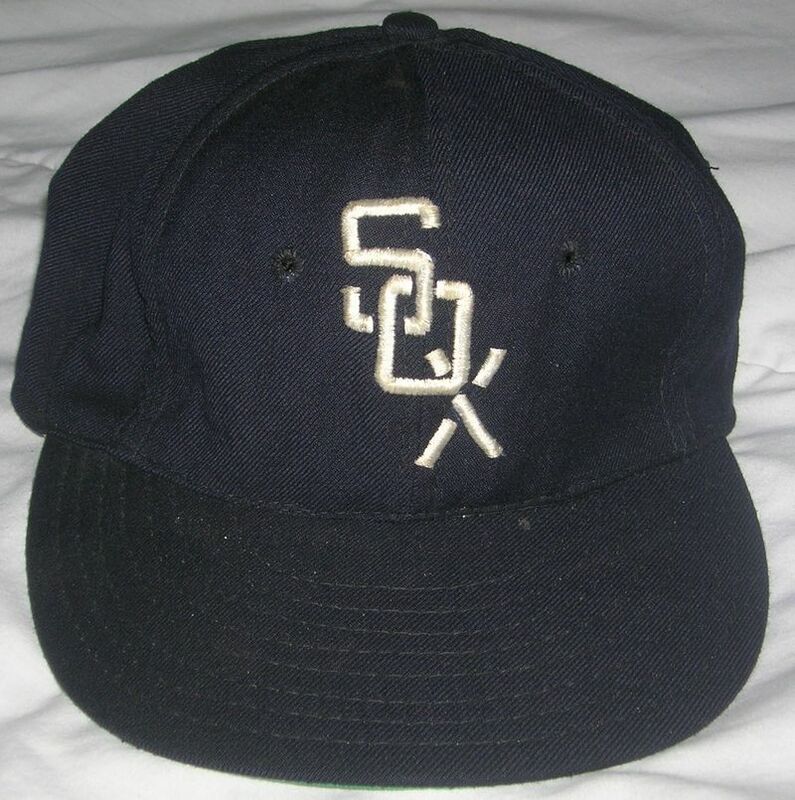 Road cap has no red outline around the logo in 1951 - anyone have one? 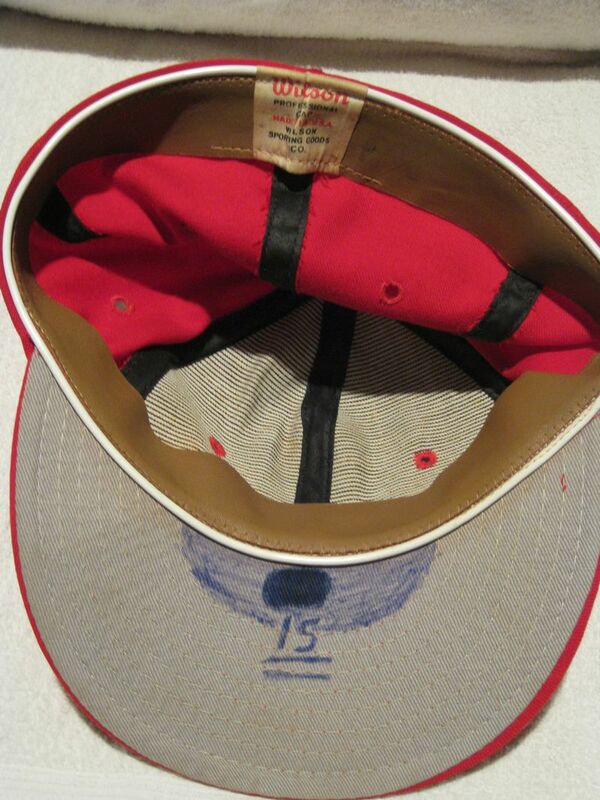 Red outline added around cap logo (and jersey lettering). 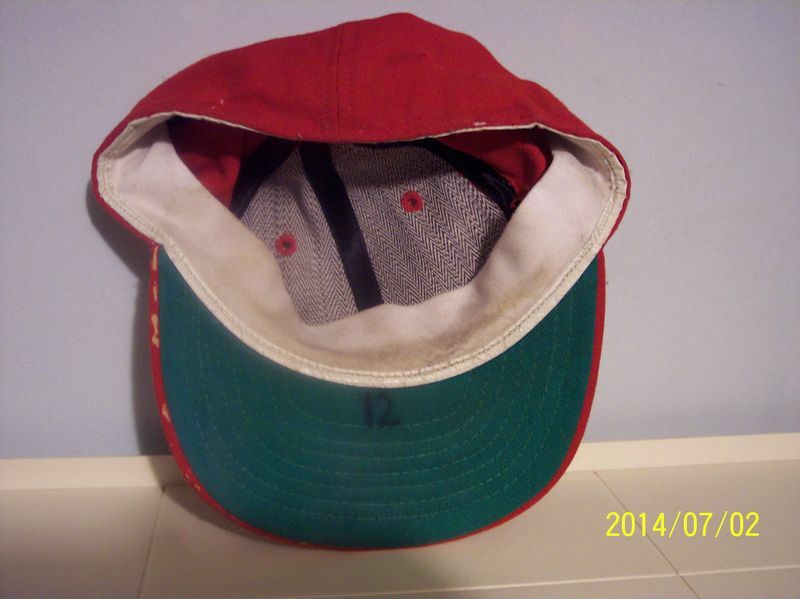 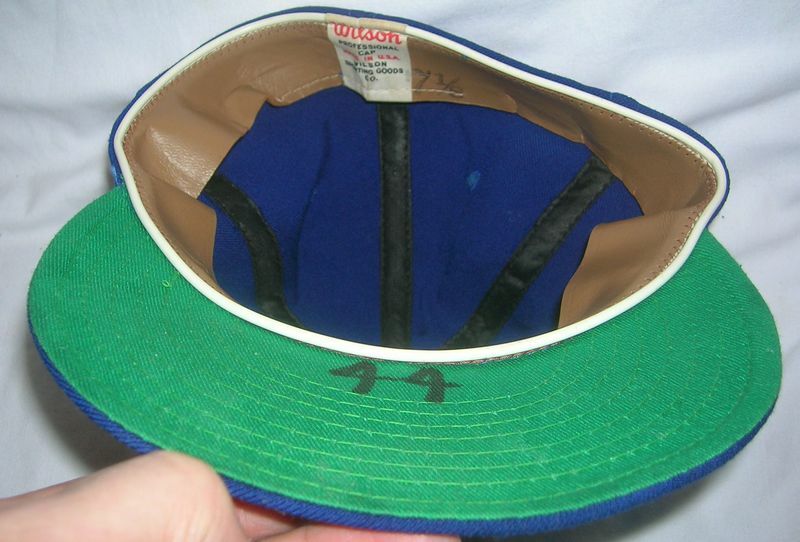 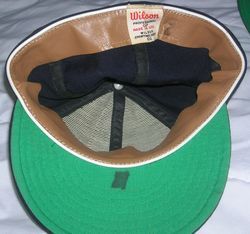 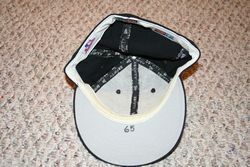 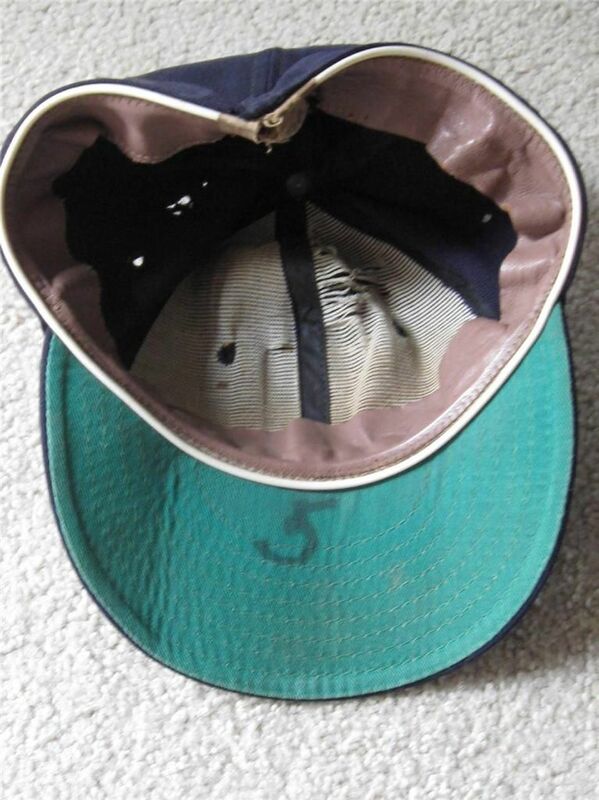 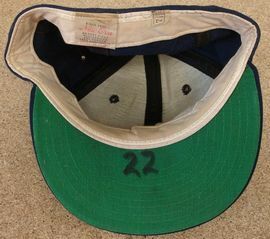 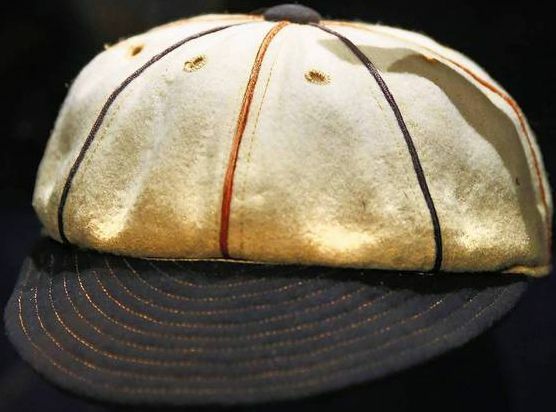 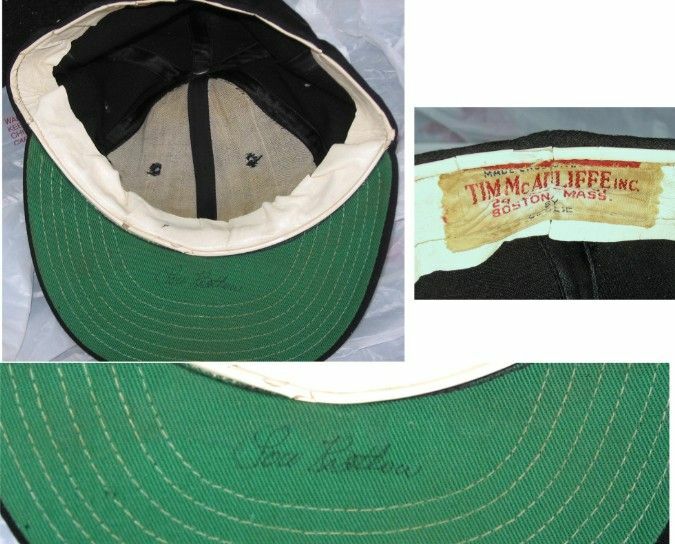 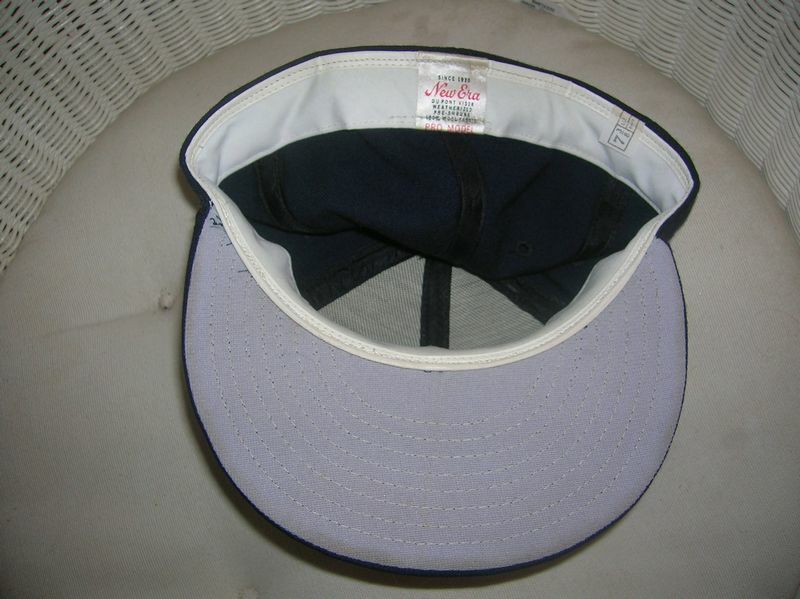 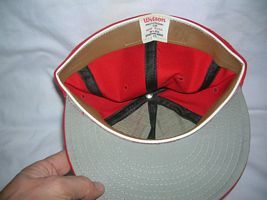 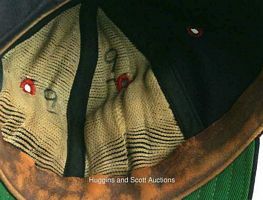 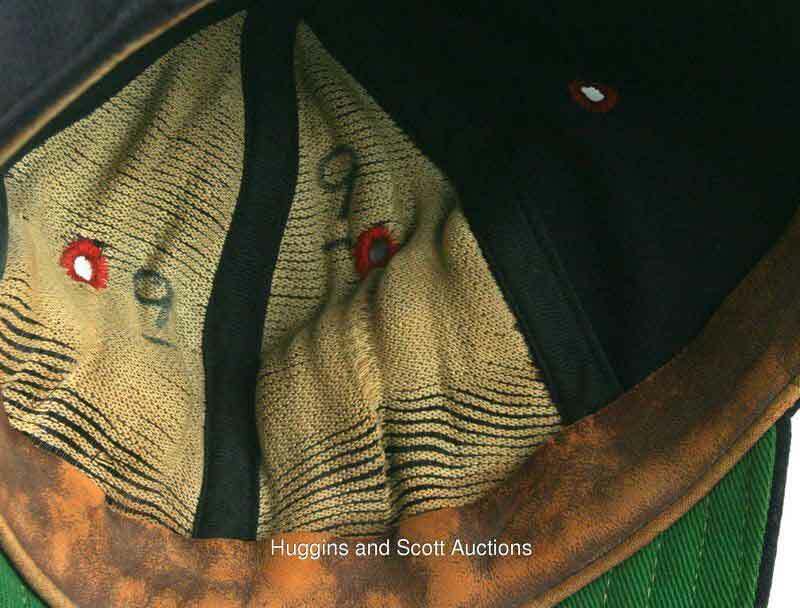 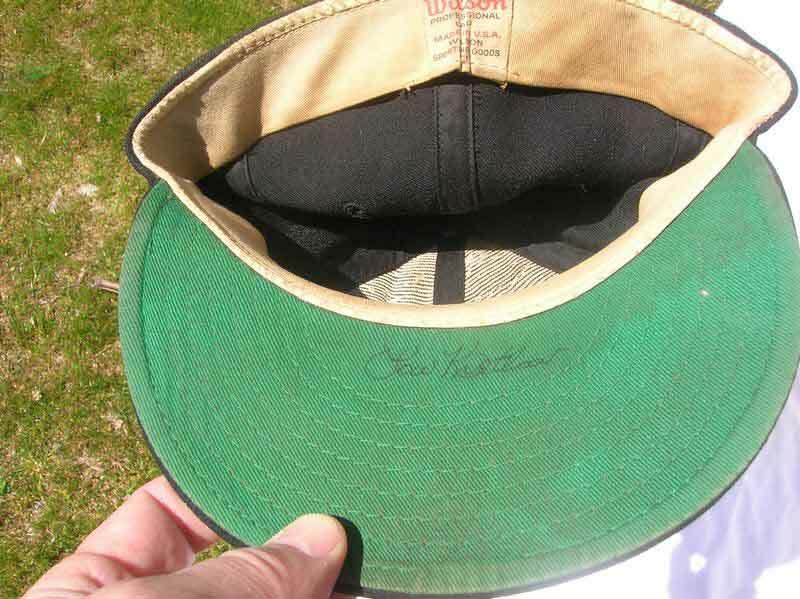 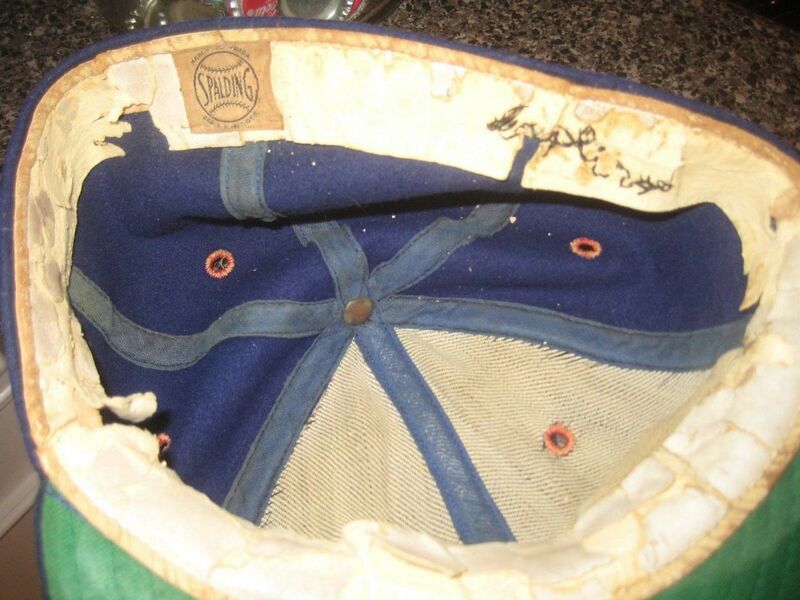 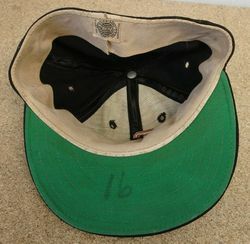 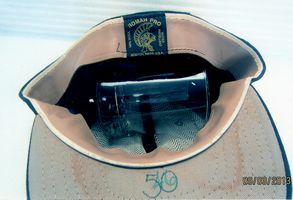 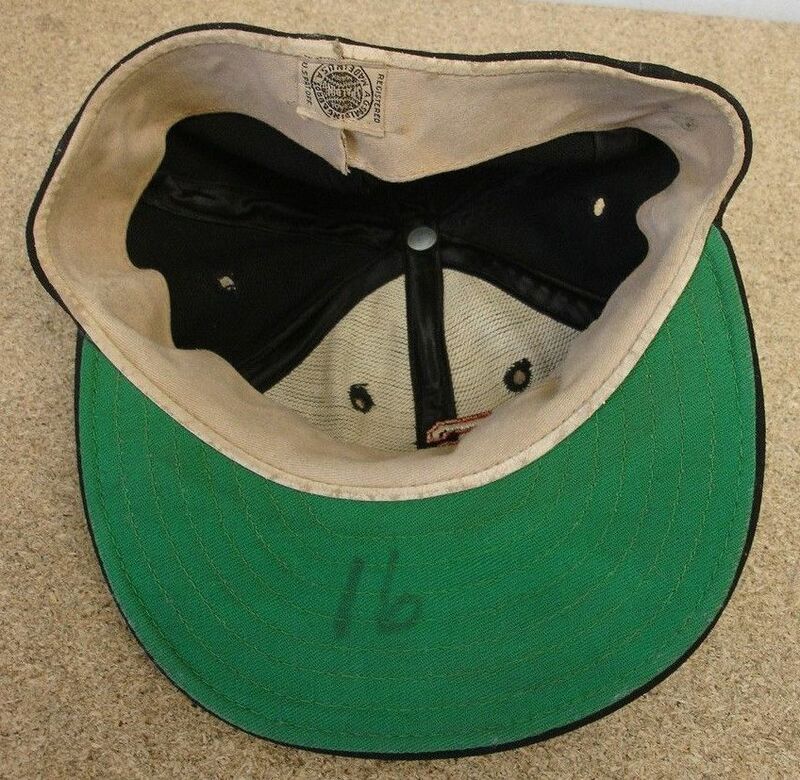 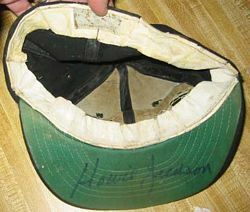 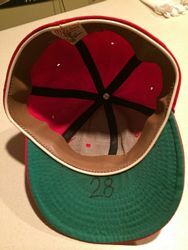 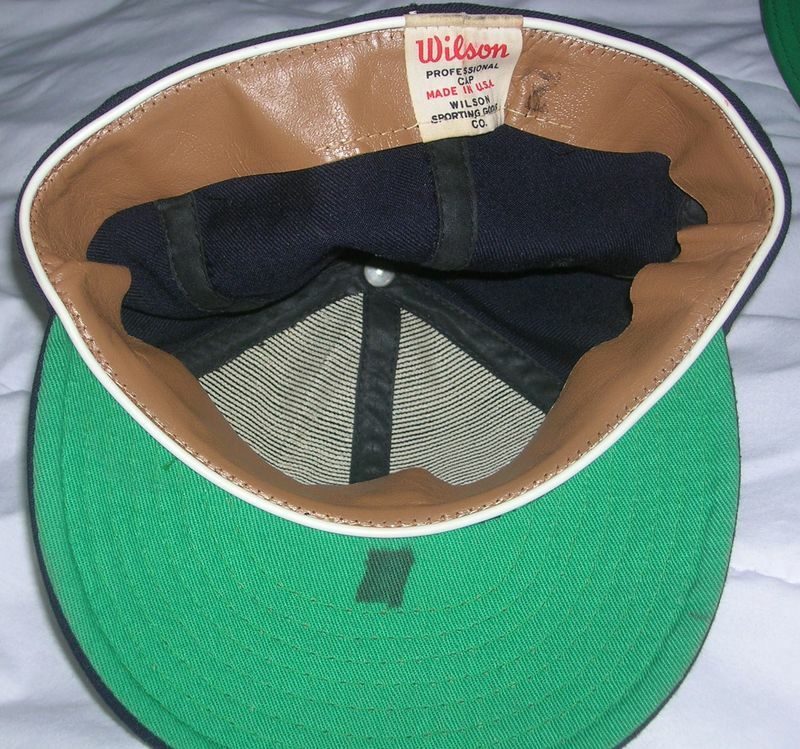 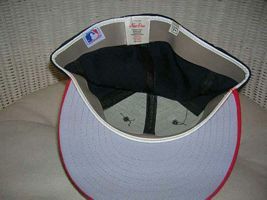 Wison cap from 1951 still used, along with McAuliffe. 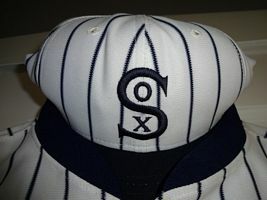 McAuliffe has interlocking "S" and "O", "O" overlies "X", and the lines of the "X" overlap. 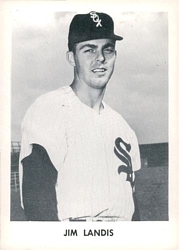 The Sox also start using Spalding caps. 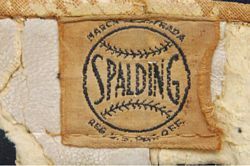 Spalding's logo is wider, and "X" overlies "O". 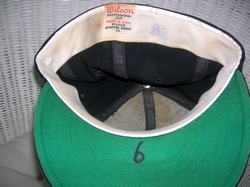 Both McAuliffe and Spalding caps seem common through about 1958. 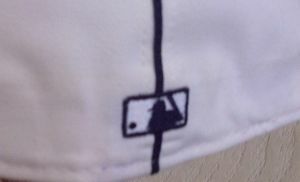 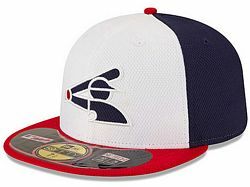 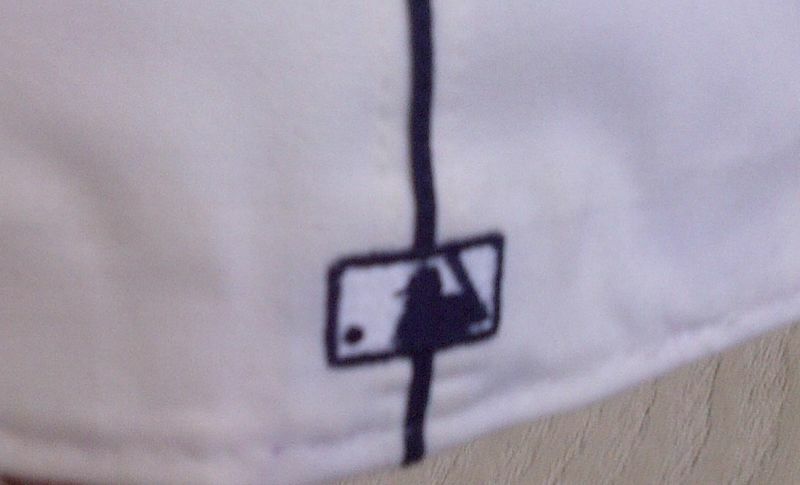 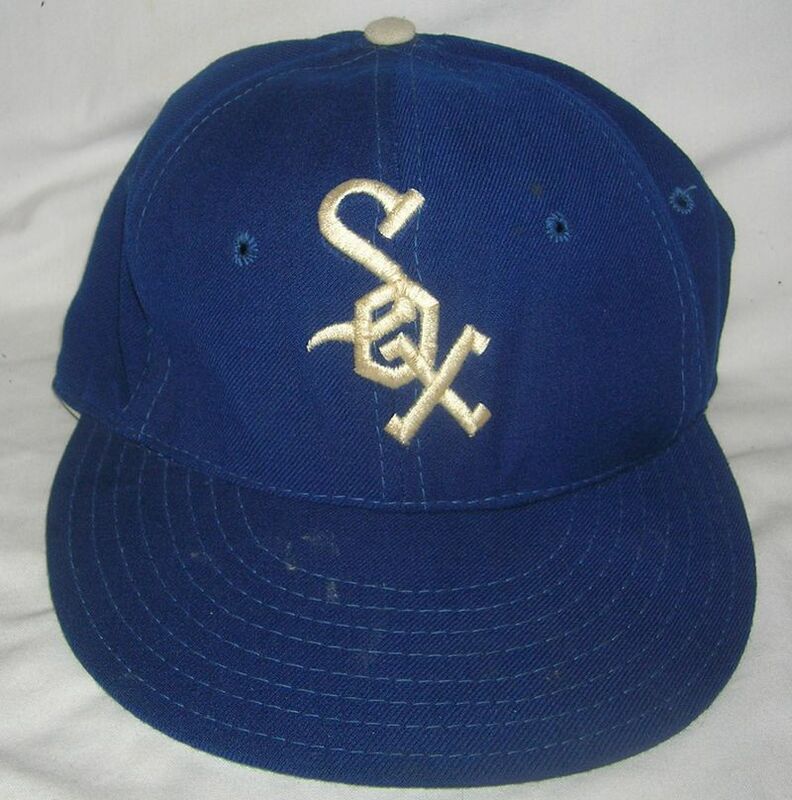 When I saw this cap I didn't think it could possibly be another style of the logo, but dang it here's a picture of Jim Landis wearing this cap in spring training. 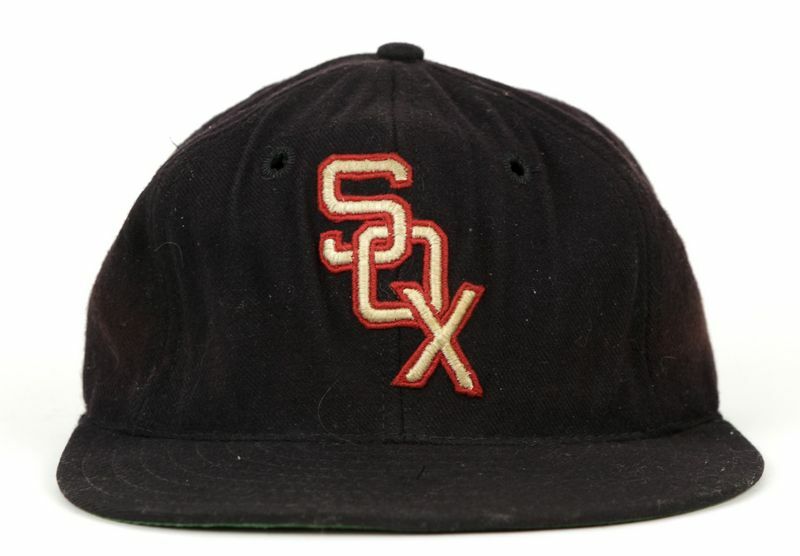 Letters are thin and rounded, the gap between the base of the "S" and the top of the "X" is larger, and unlike all other versions, the red trim does not cross any letters. 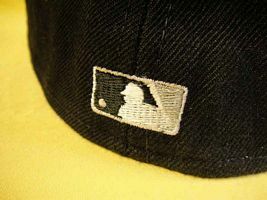 Worn during the season? 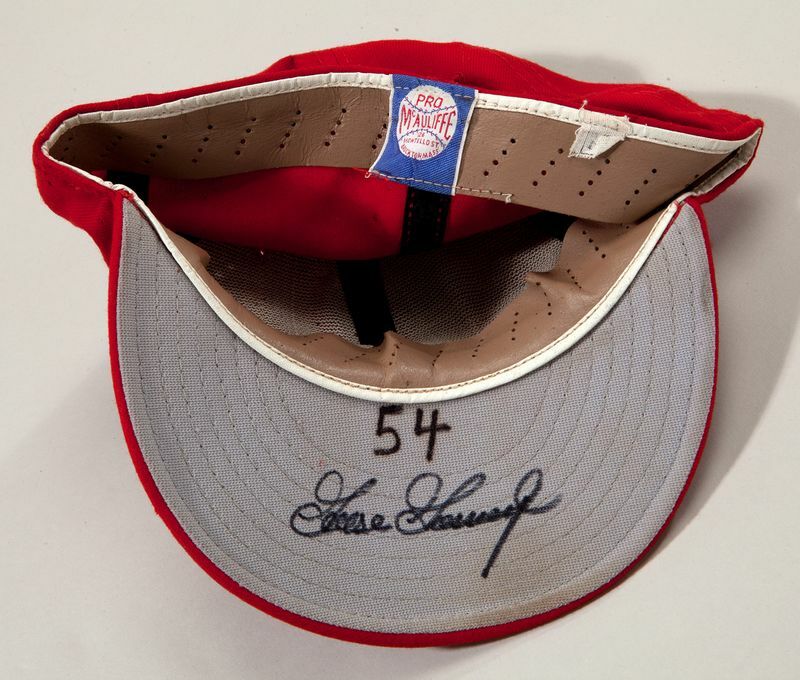 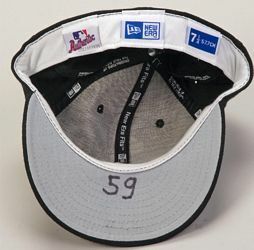 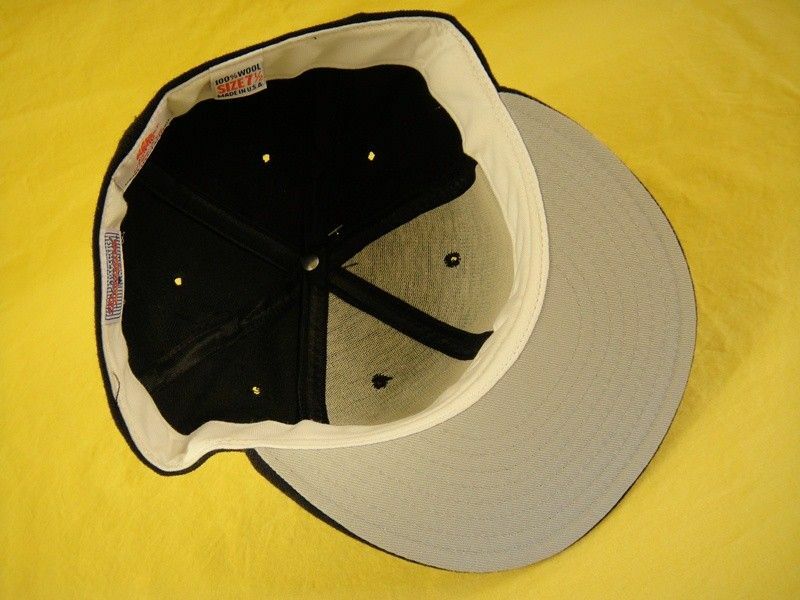 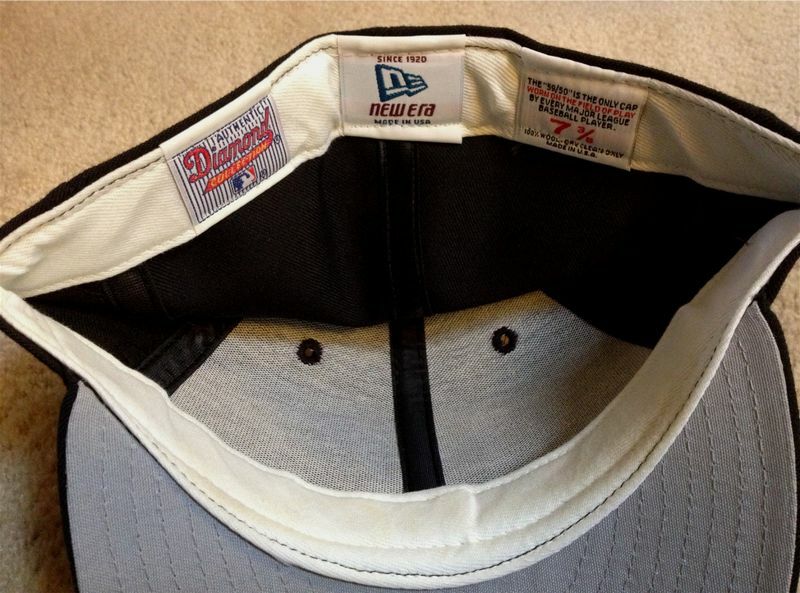 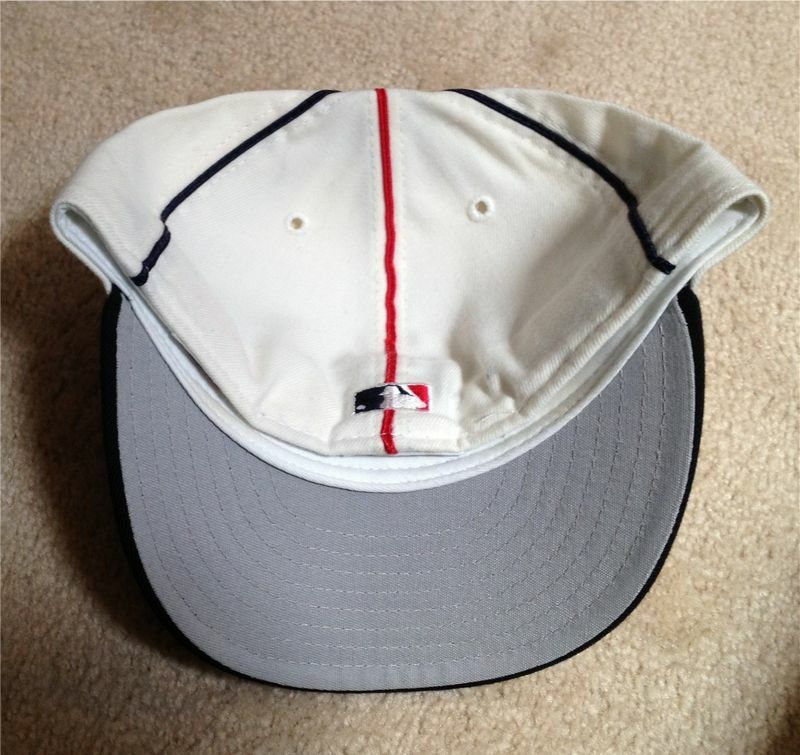 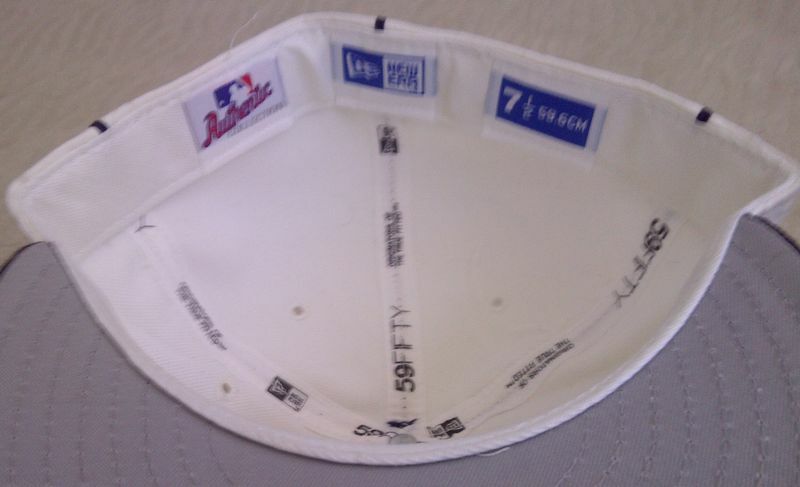 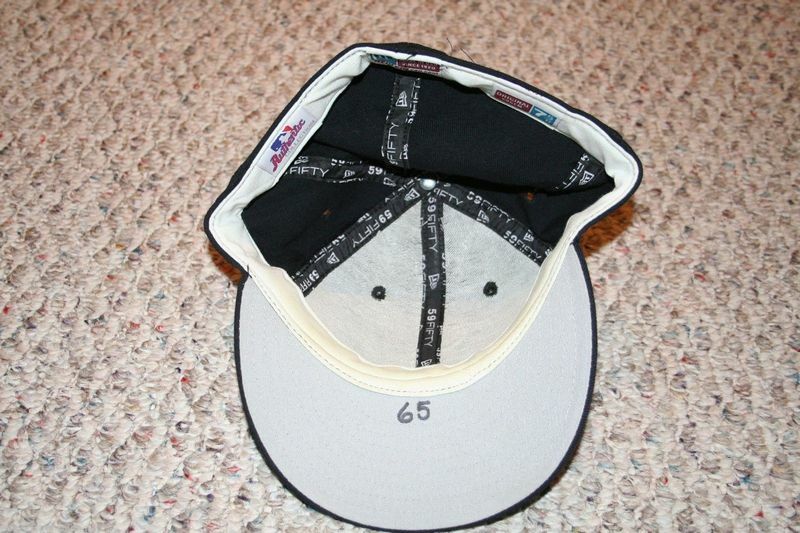 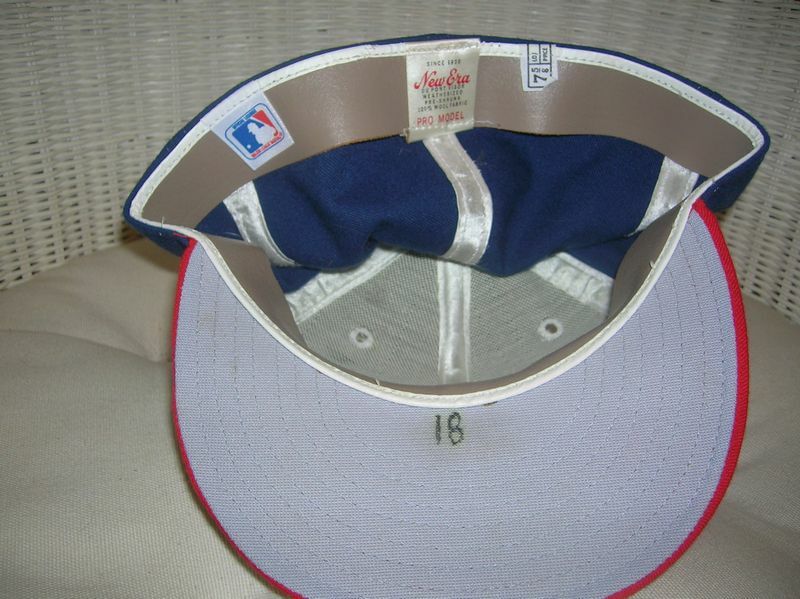 Who knows, but we do know the Sox used McAuliffe caps. 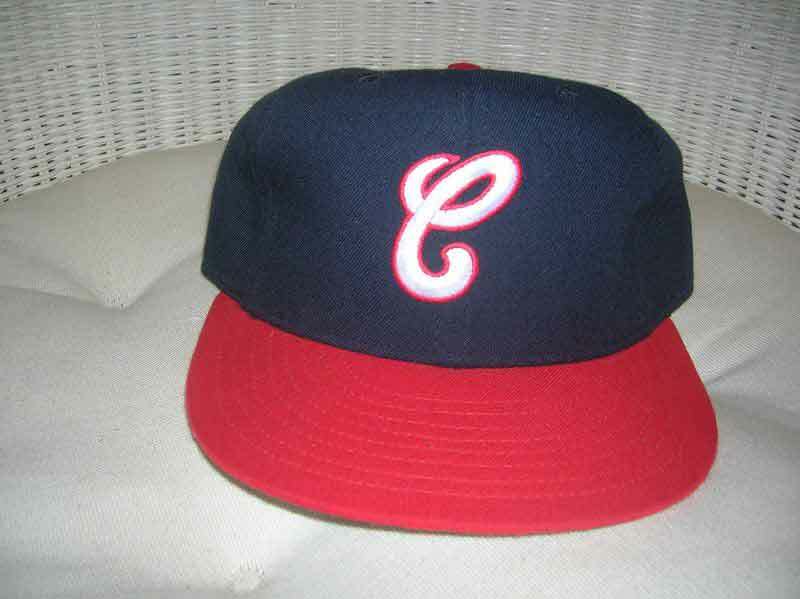 The McAuliffe logo stays thin but now the letters are squared, the red trim crosses letters at interlocks, and the "S" and "O" have more pronounced angles. It appears Wilson caps were used almost exclusively 1960-63. "S" and "O" interlock and there's more space between the bottom of the "S" and the top of the "O". And "O" overlies "X". AND, it appears from photos I've seen, that a road cap without a red outline around the logo, debuts, and here the "S" and "O" interlock reverses, and "O" overlies "X". But now, "X" overlies "O". 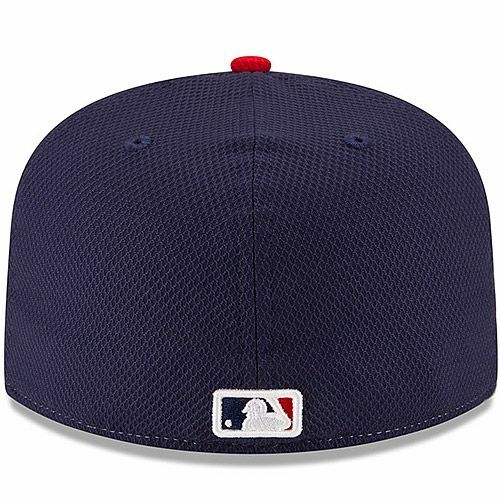 Color changes from midnight navy (i.e., black) to navy.The logo letters now have gaps where they overlap/interlock. 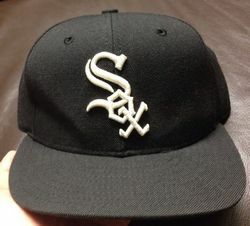 The "S" and "O" interlock reverses yet again. 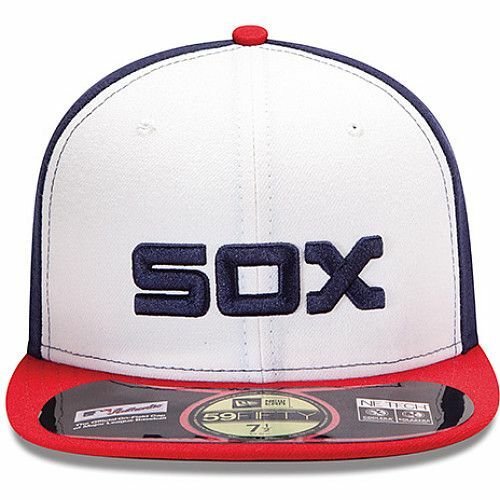 The White Sox are now red Sox. 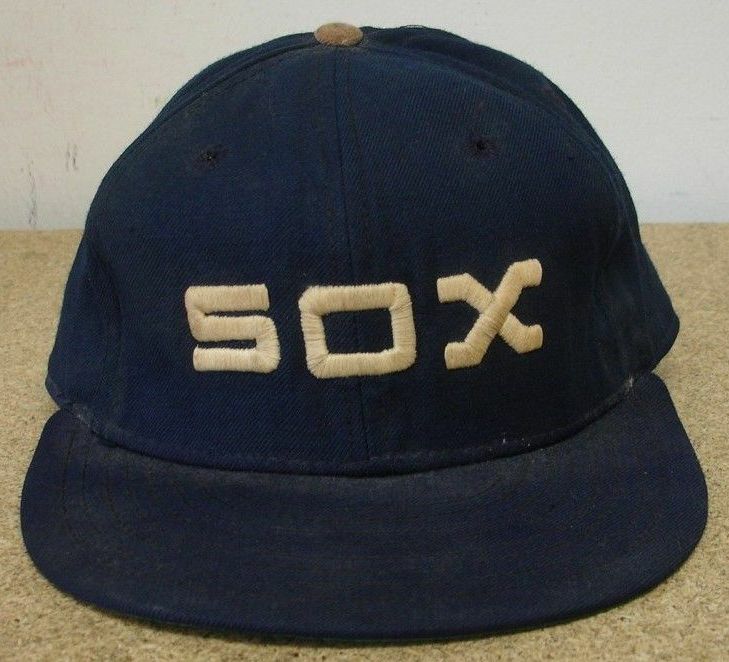 The Sox start using grey underbrims around 1972. 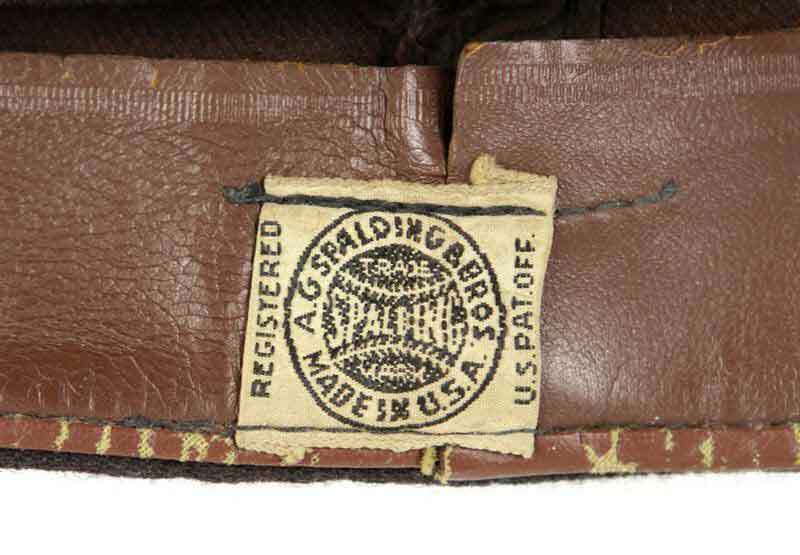 Here's a rare Pro McAuliffe, made for McAuliffe Uniform, owned by Stall & Dean's Richard Stall. 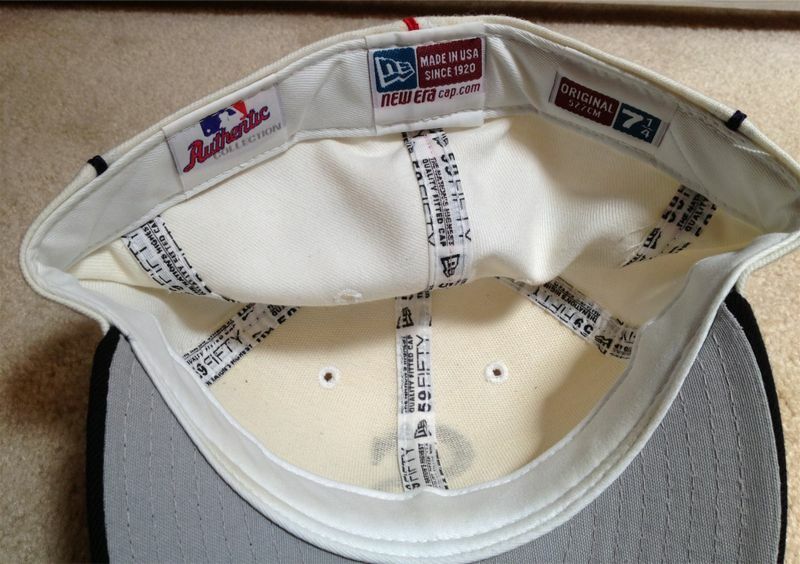 It's clearly a New Era-made cap under private label. 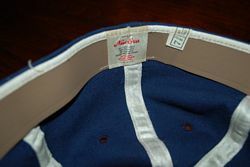 LOA from the Goose worn in 1972. 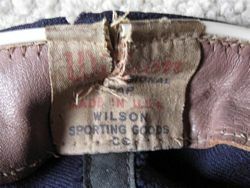 In 1974 New Era stopped private label capmaking for Wilson. 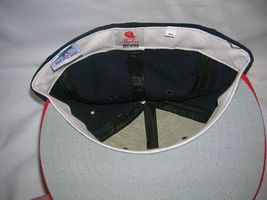 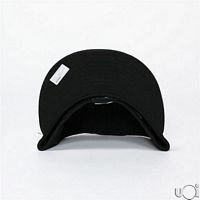 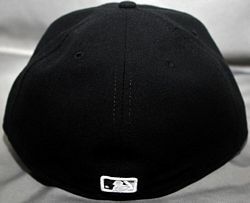 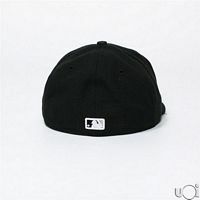 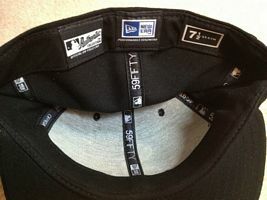 This cap could have been made by New Era but it was finished off by someone else. 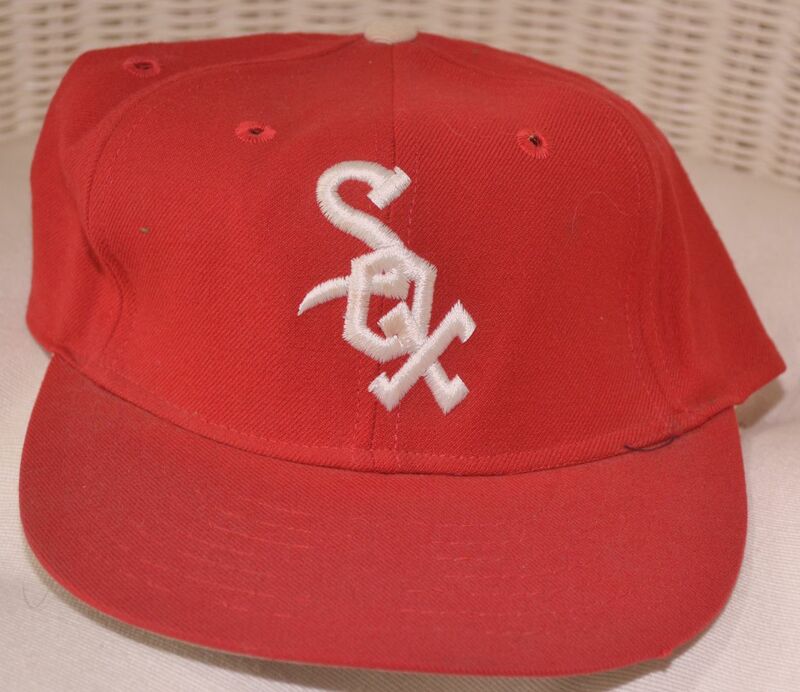 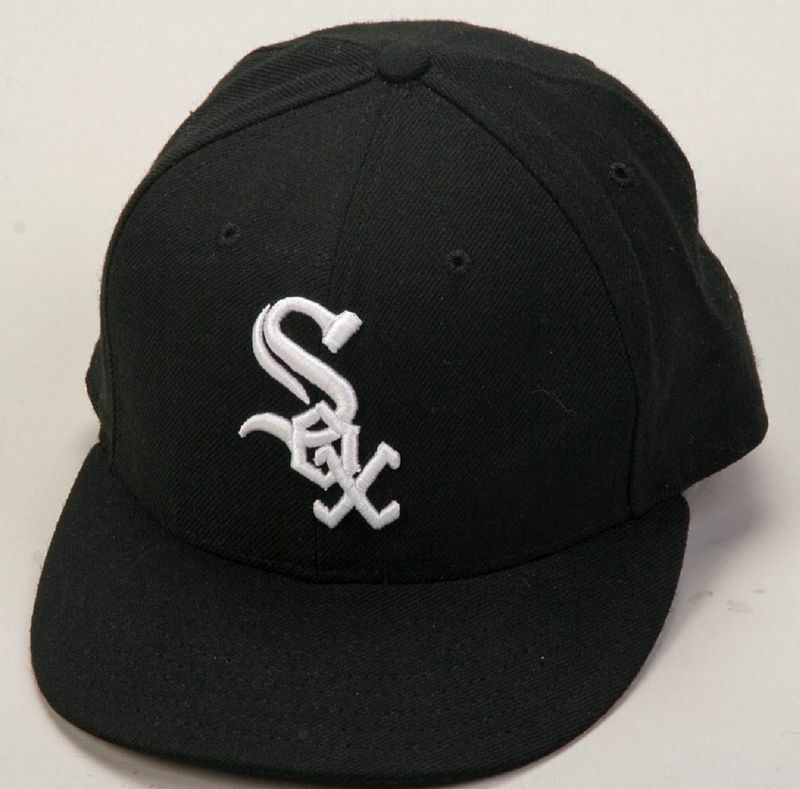 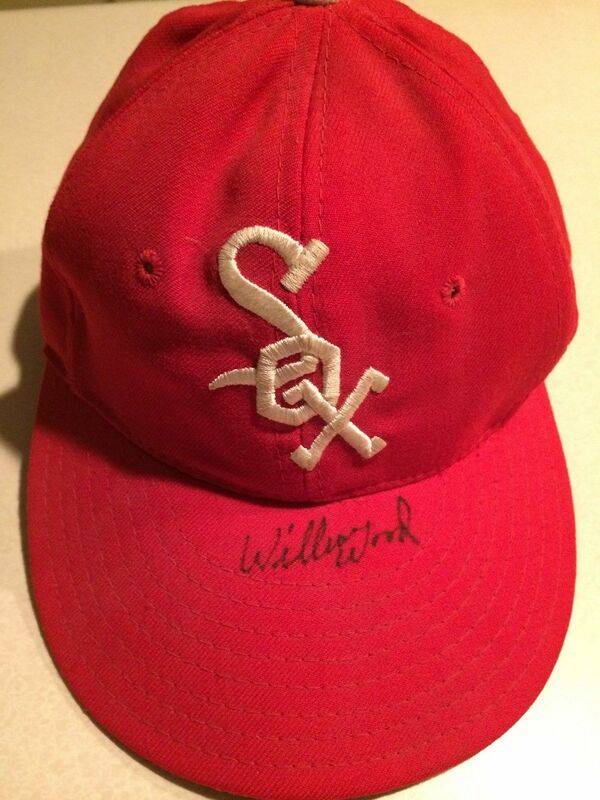 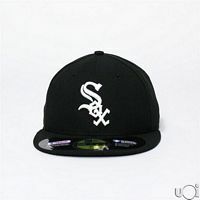 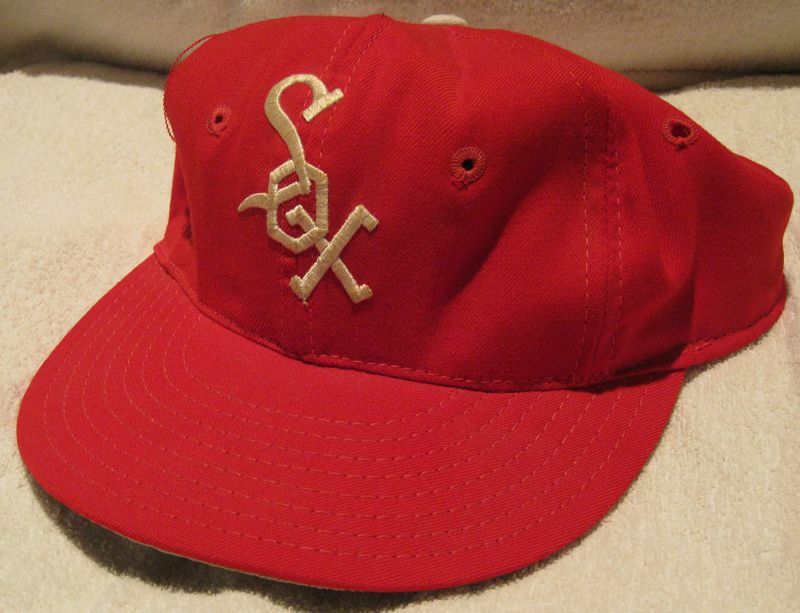 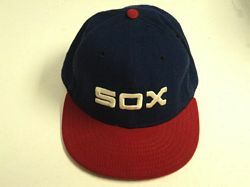 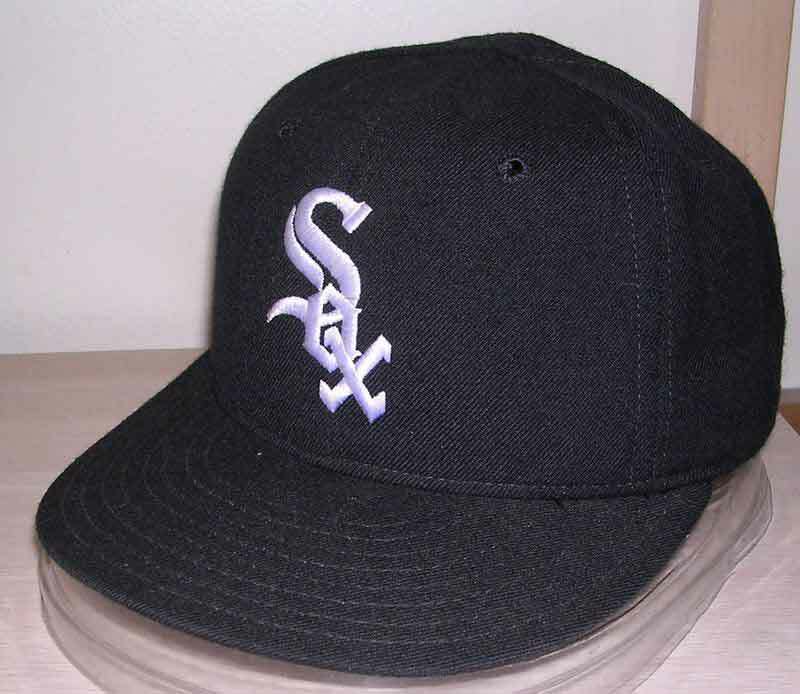 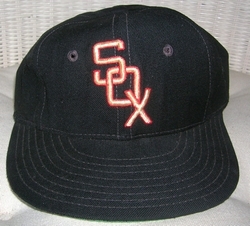 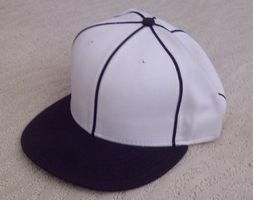 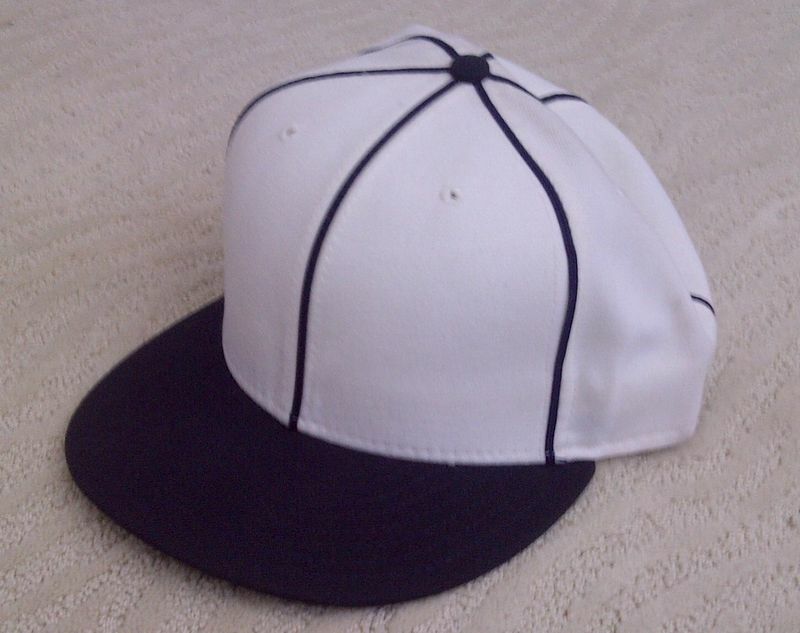 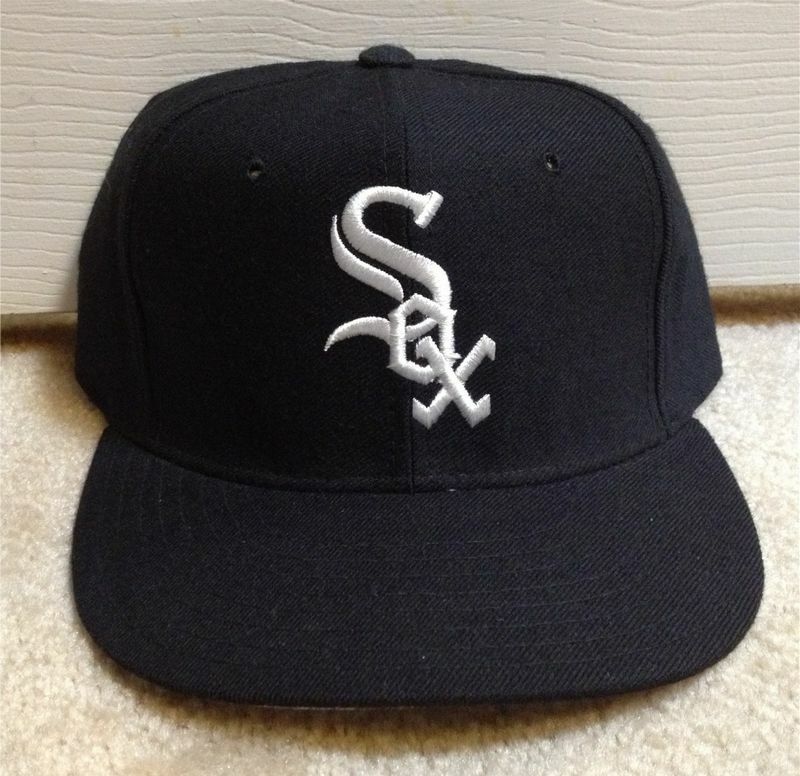 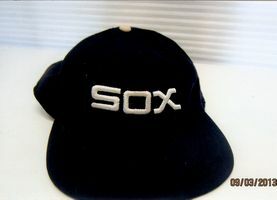 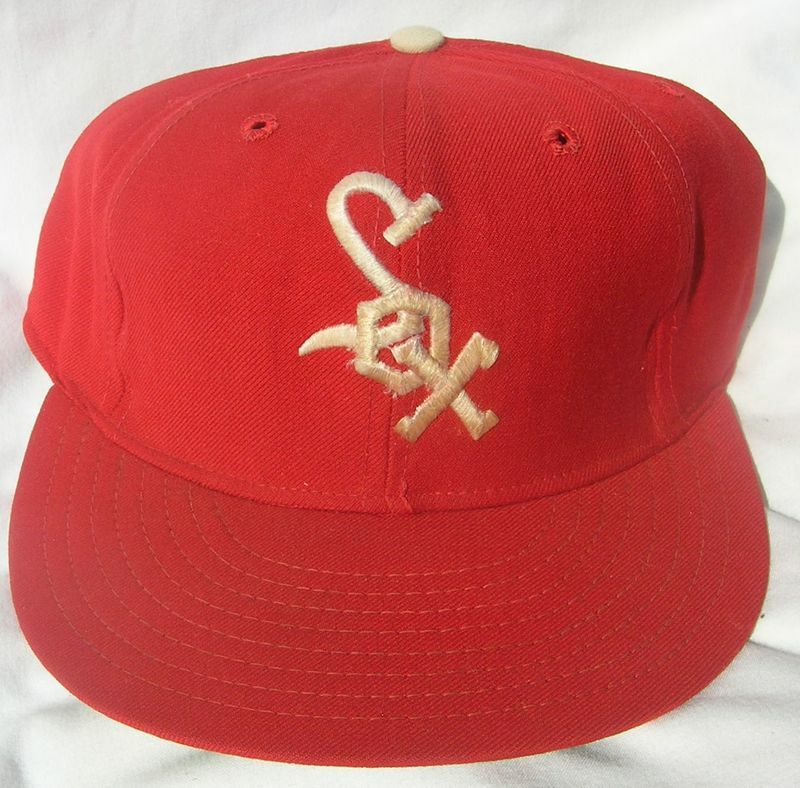 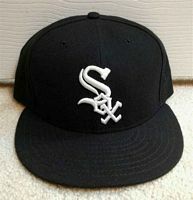 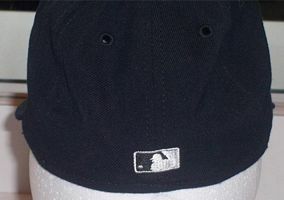 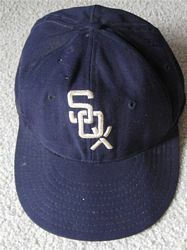 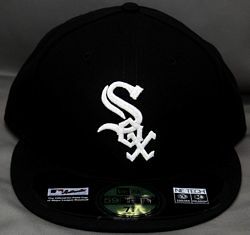 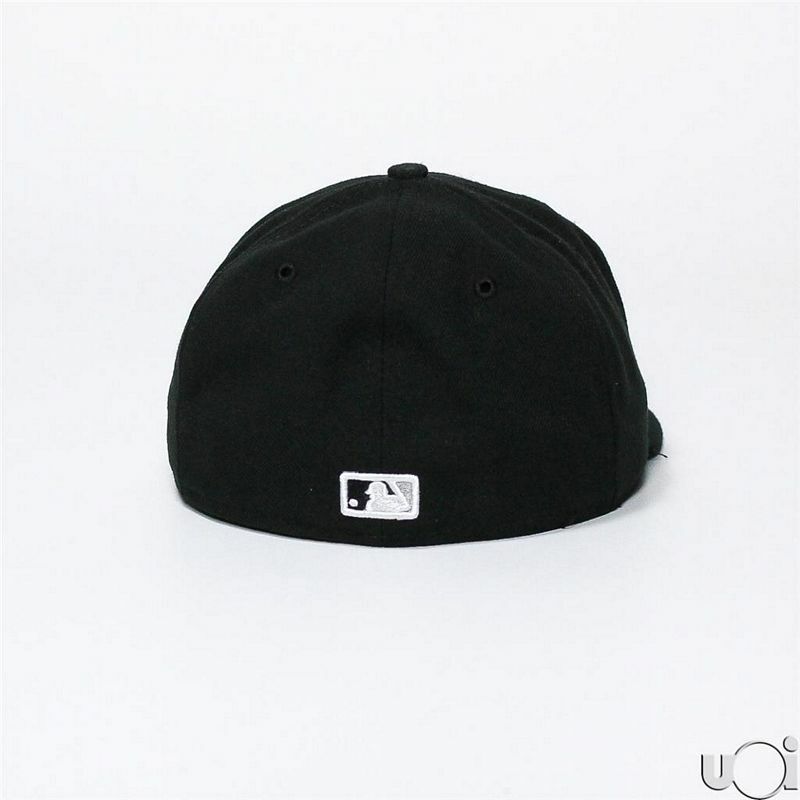 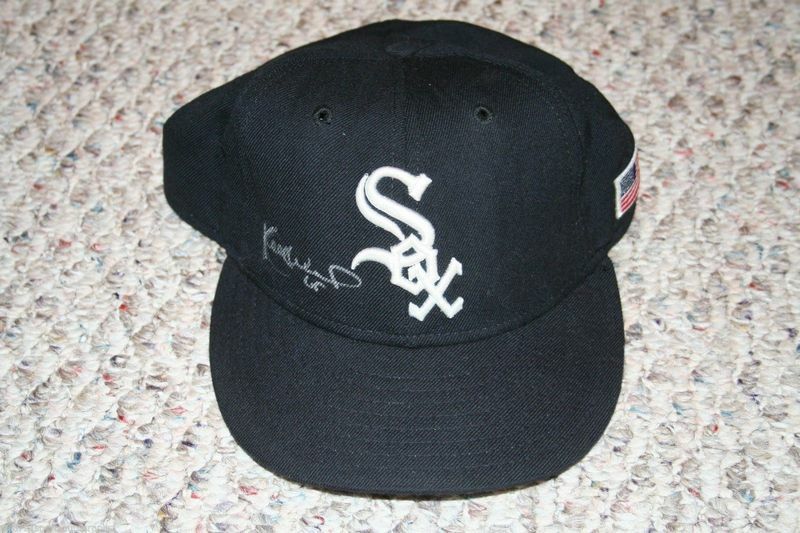 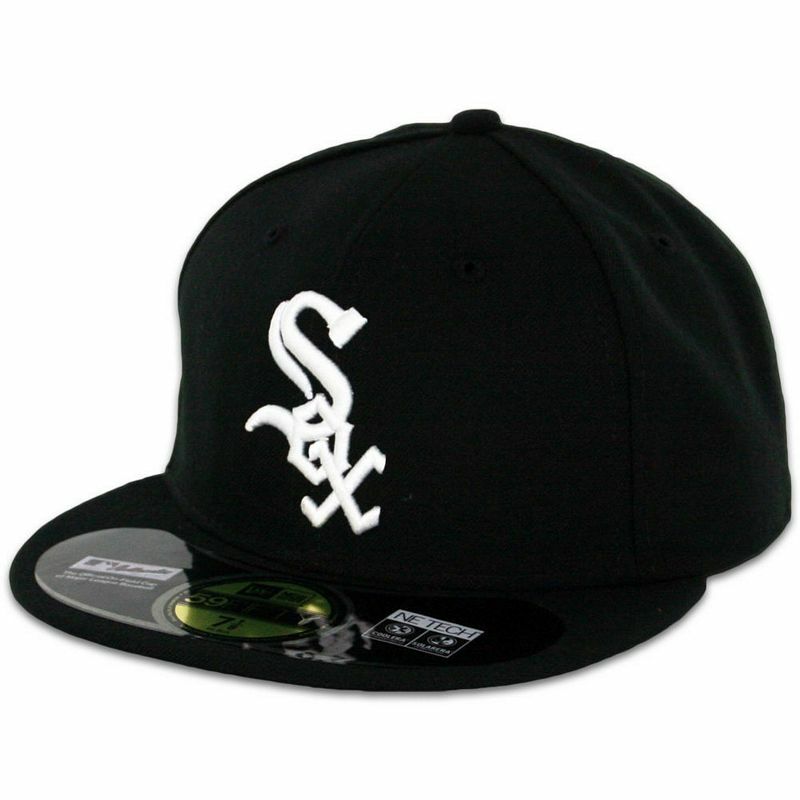 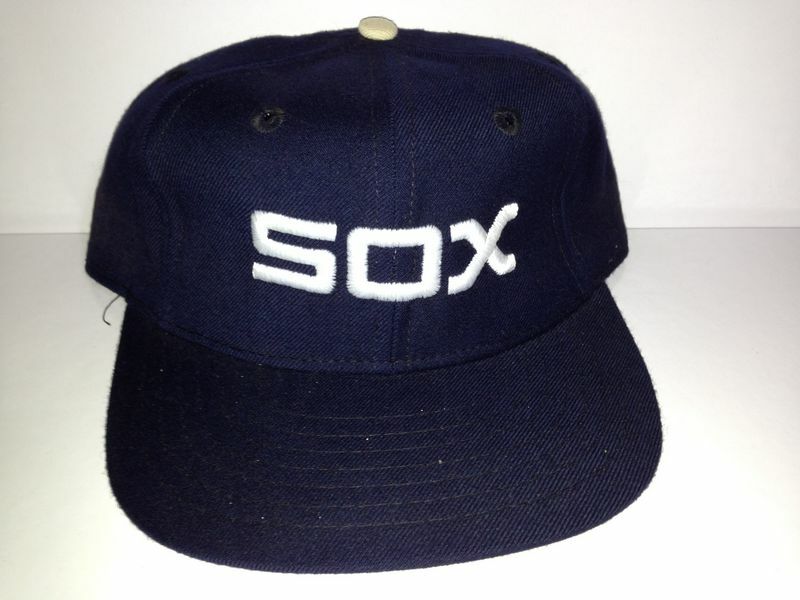 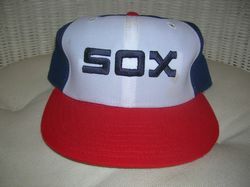 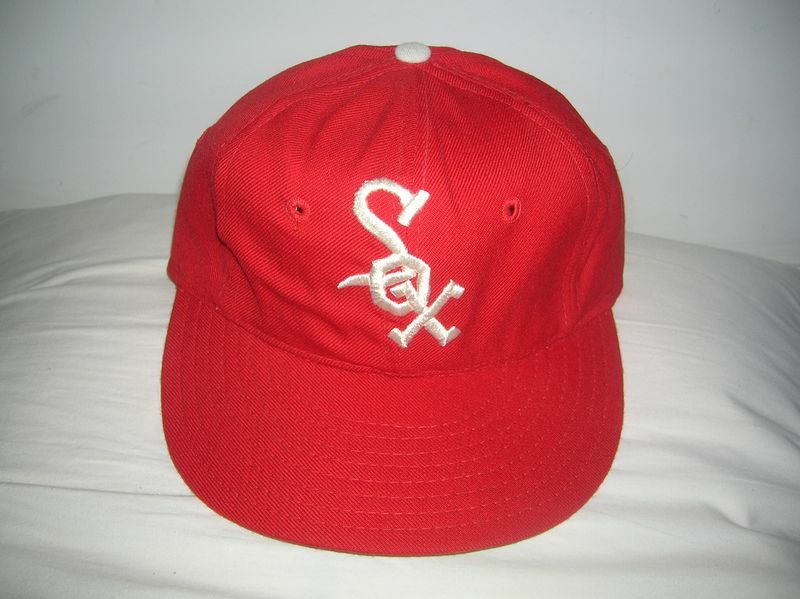 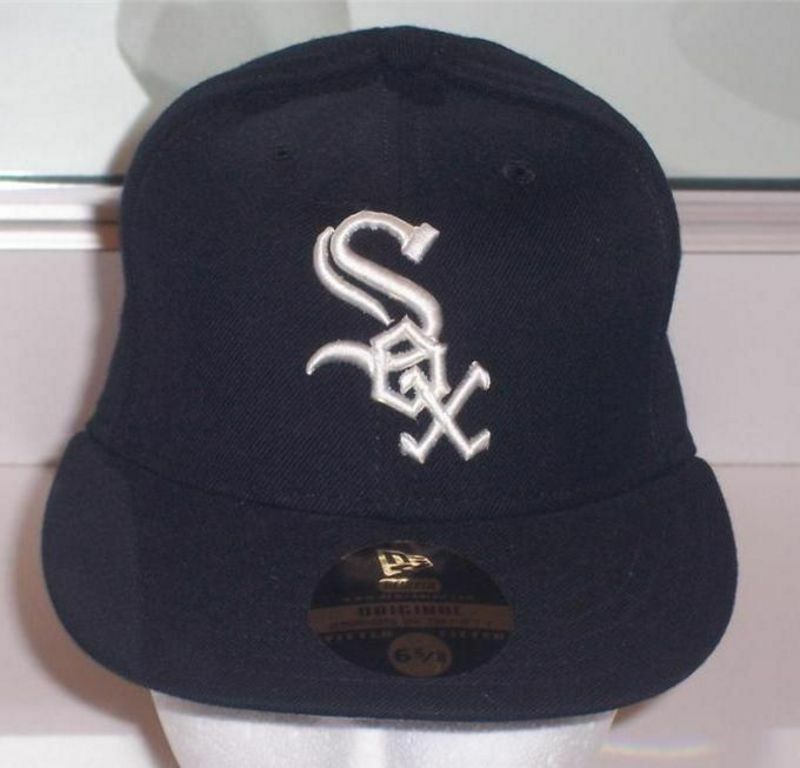 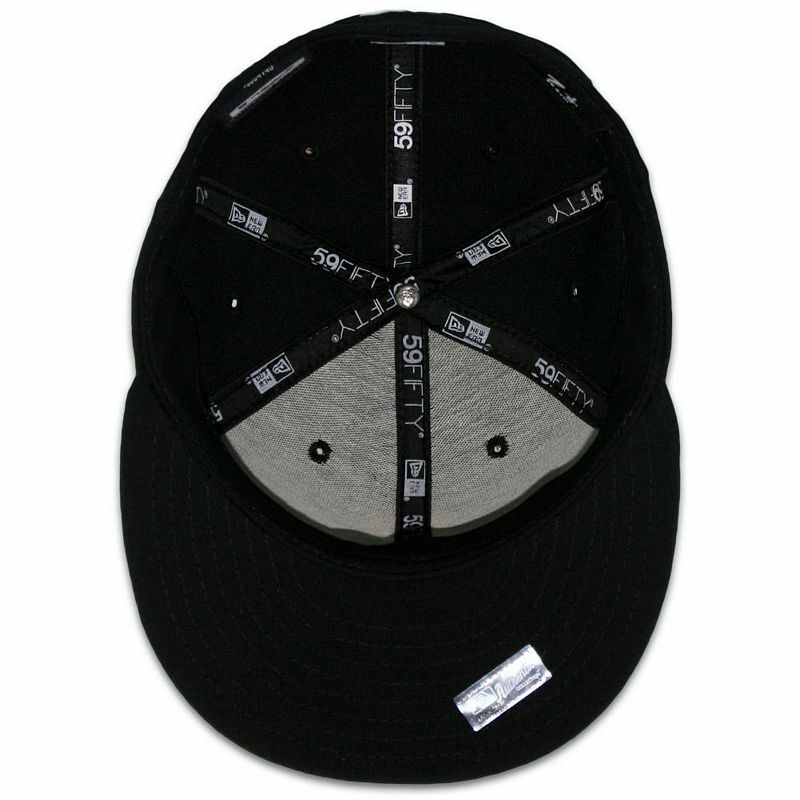 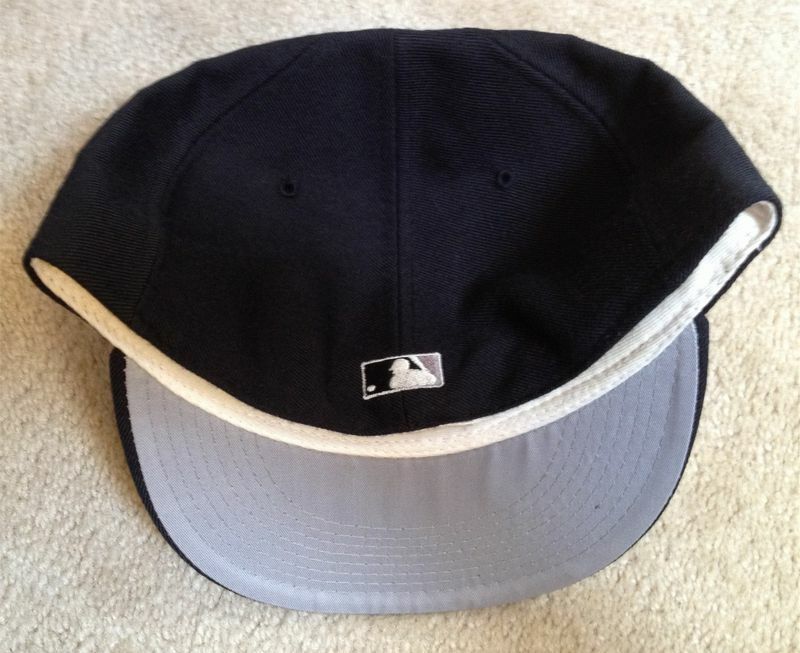 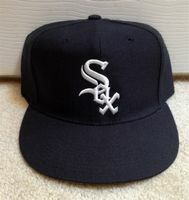 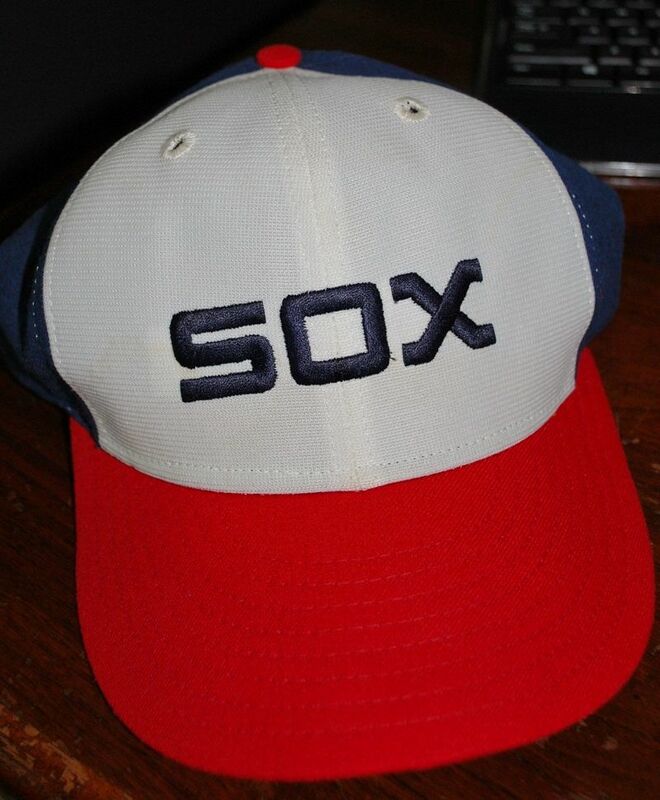 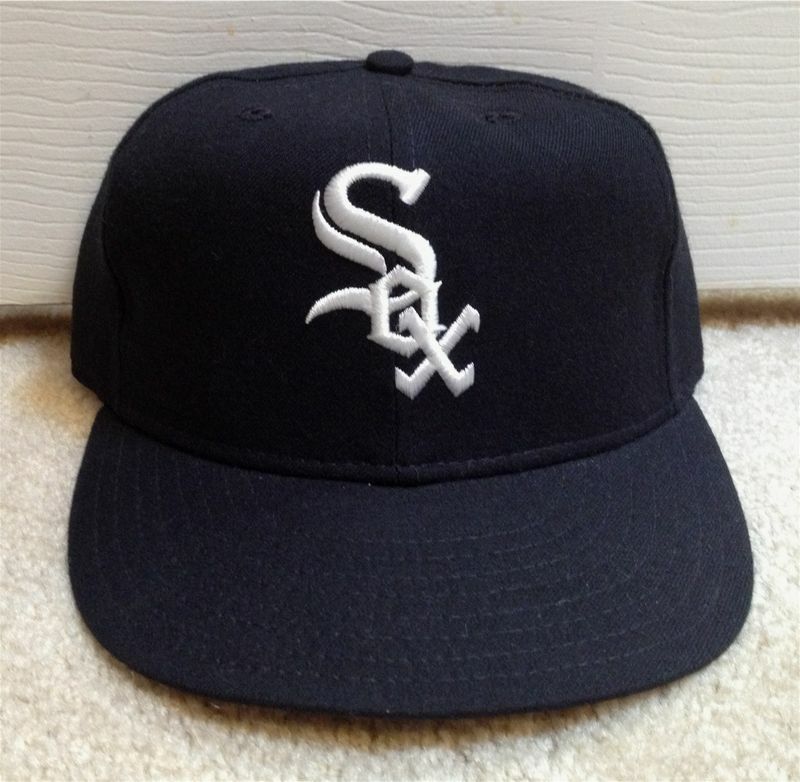 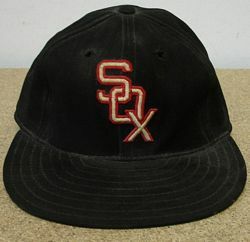 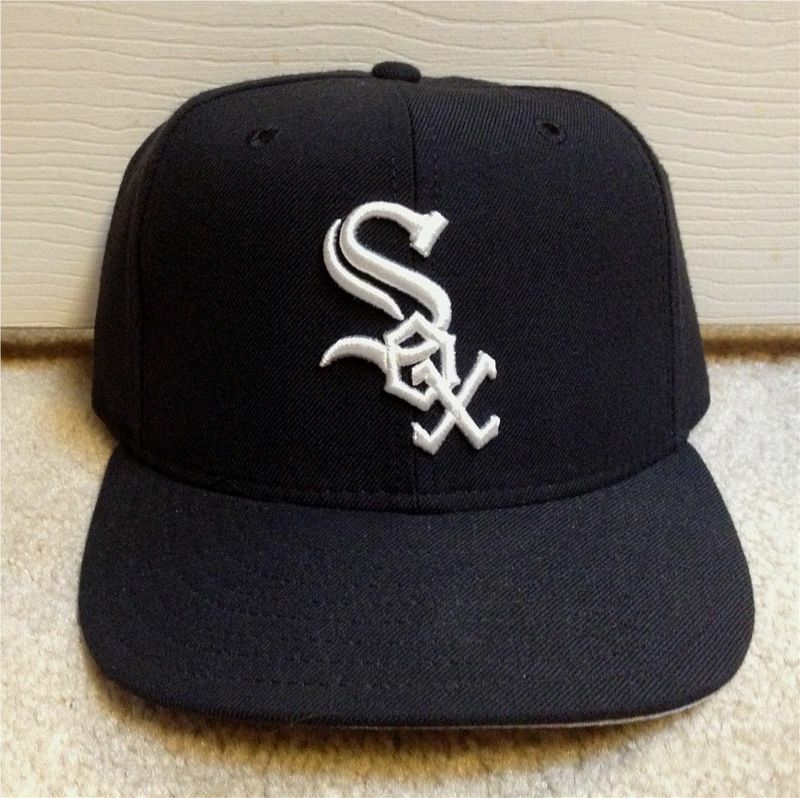 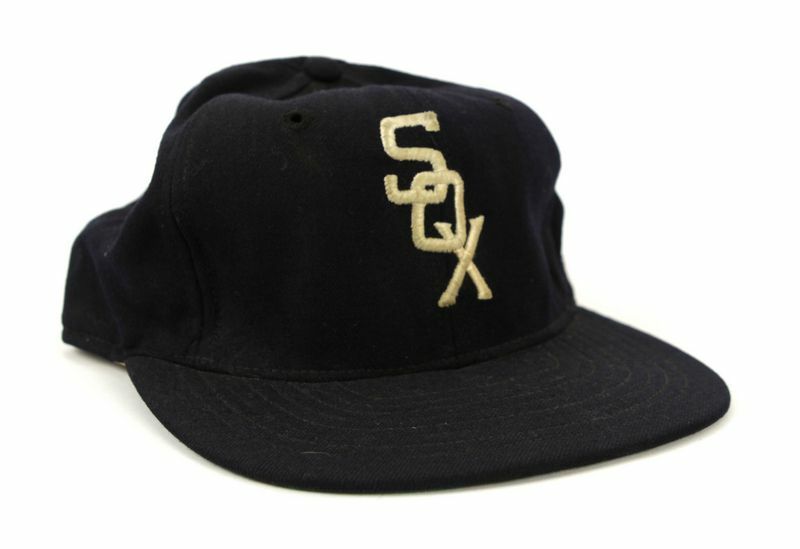 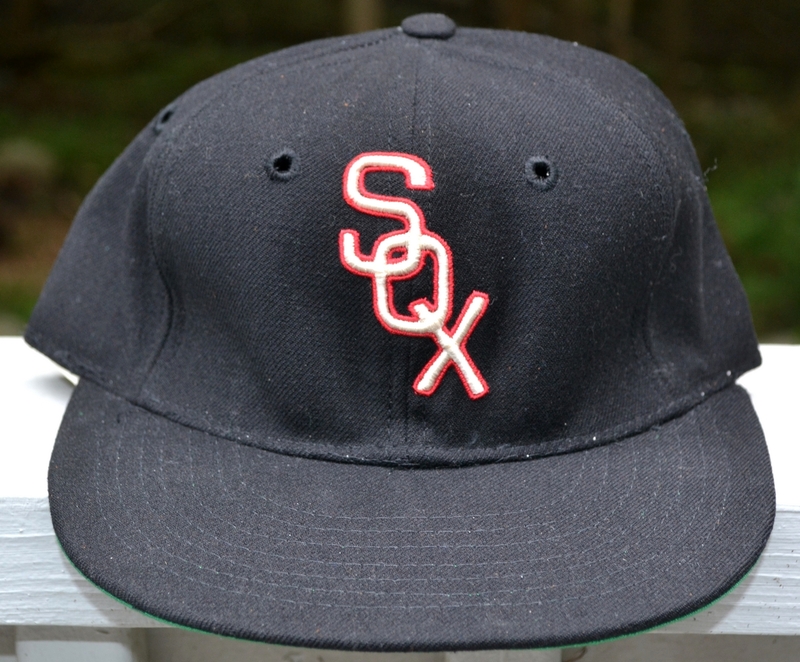 The 1974 Wilson White Sox cap is unique in that: letters are thinner, "S" interlocks with "o", and "o" overlies "x". This is exactly how American Needle embroiders throwbacks today, probably they did the embroidering and/or made this cap for Wilson. 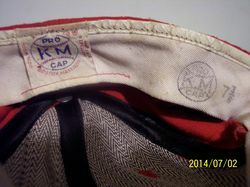 The Sox also use KM Pro. 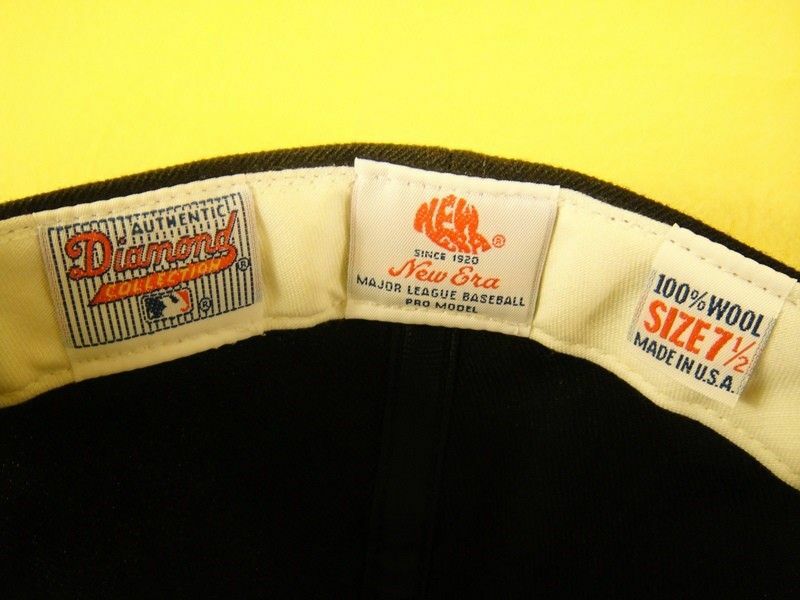 In 1975 the Sox use both New Era and KM Pro, now with green underbrims (confirmed by pictures). 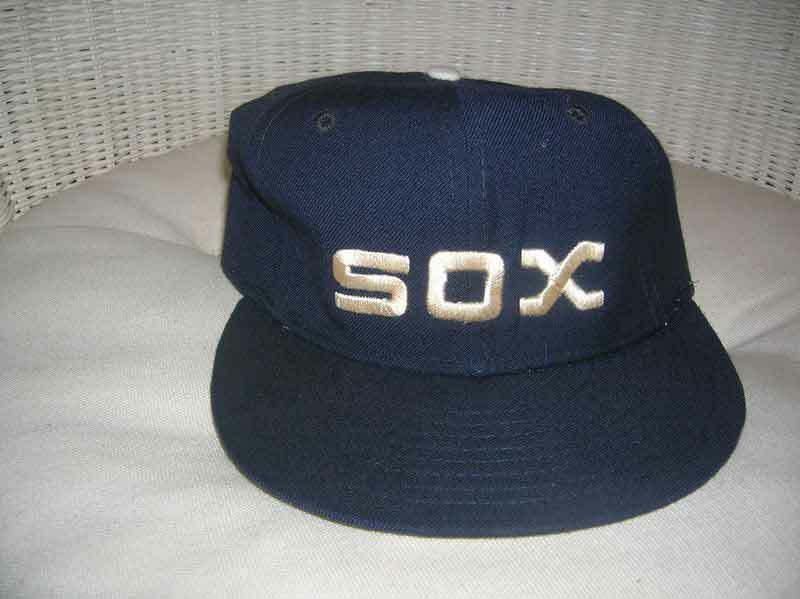 The Sox turn retro and bring back navy. 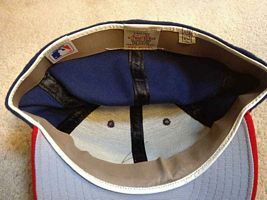 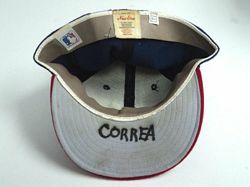 A white cap with blue visor was used on an April 13-21, 1976 road trip to Minnesota, Boston & New York, after which it was banned by the A.L. 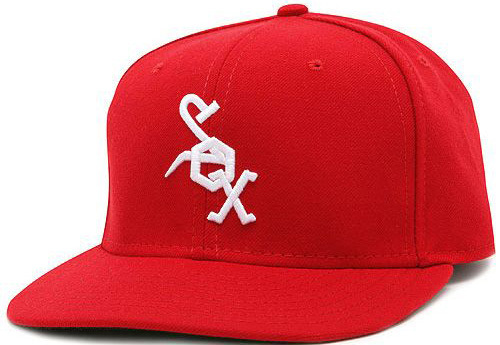 for being too distracting to the hitters. 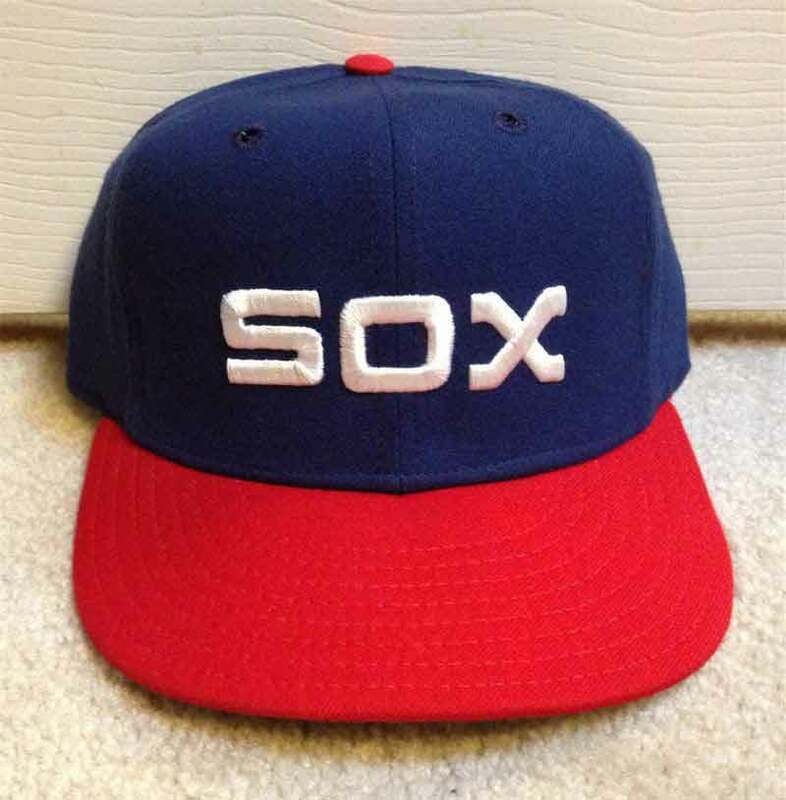 After KM Pro goes under, the Sox turn to Roman Pro. 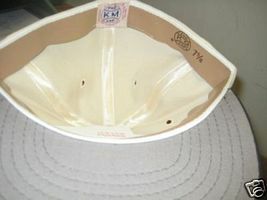 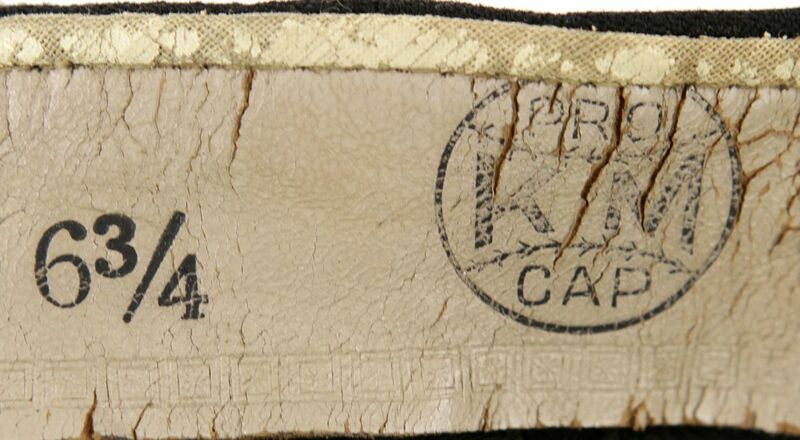 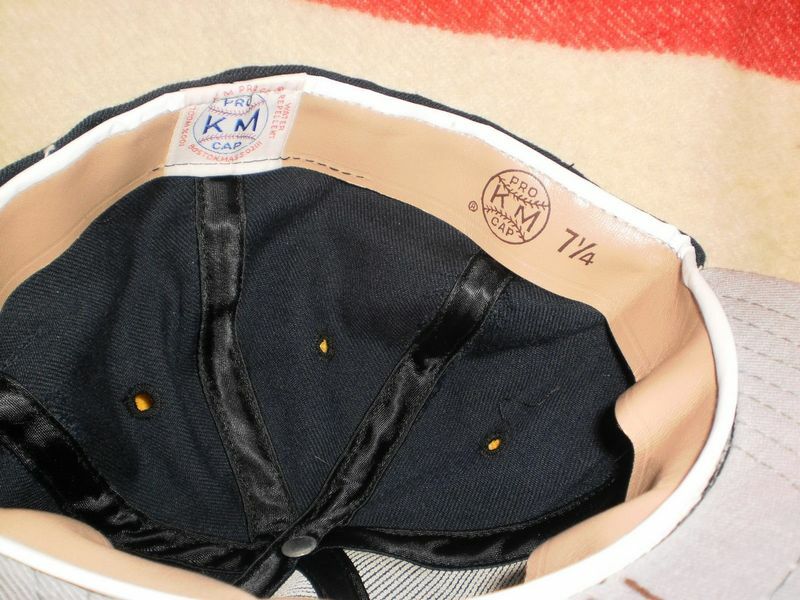 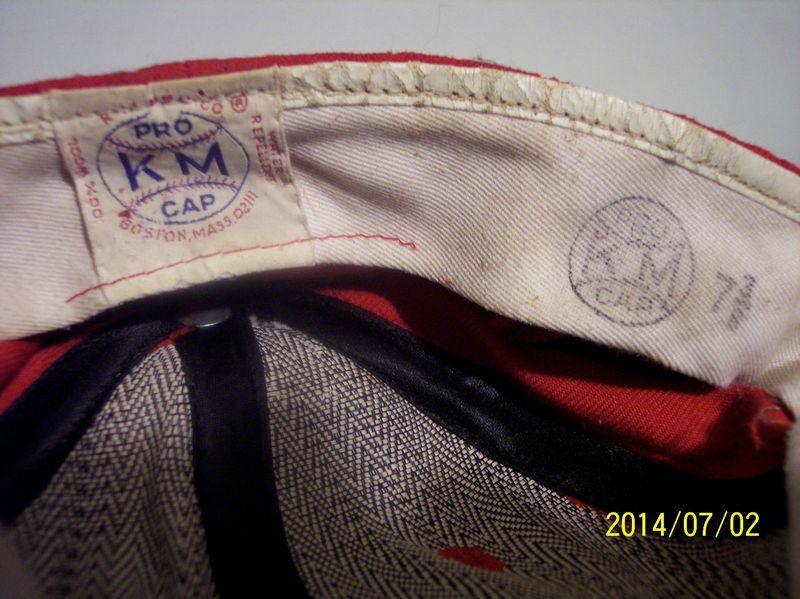 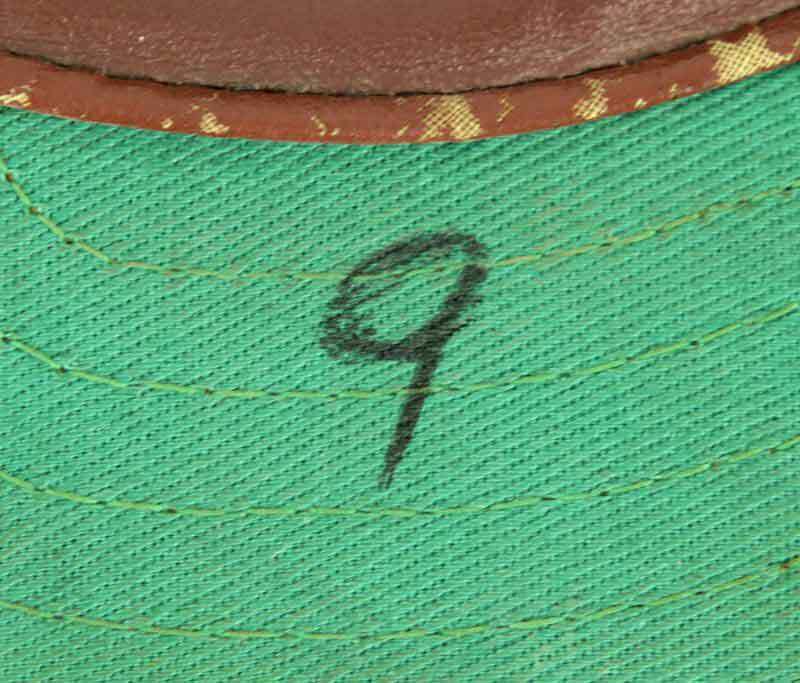 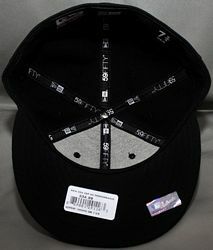 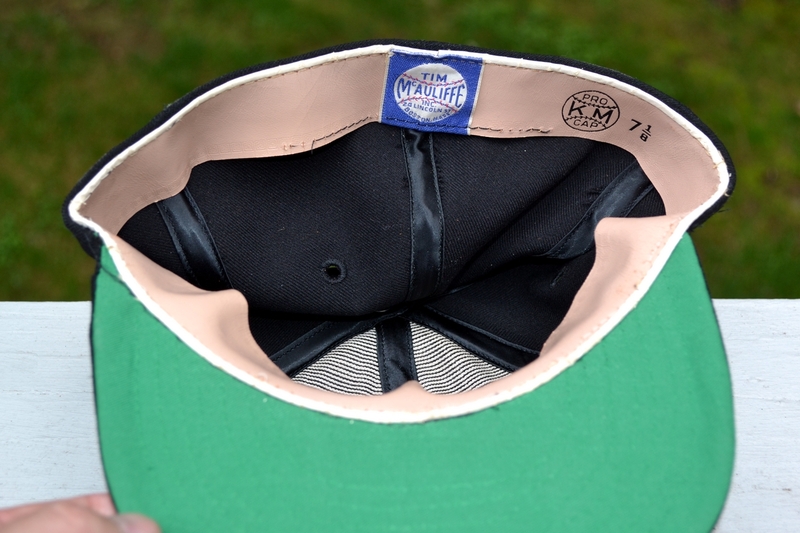 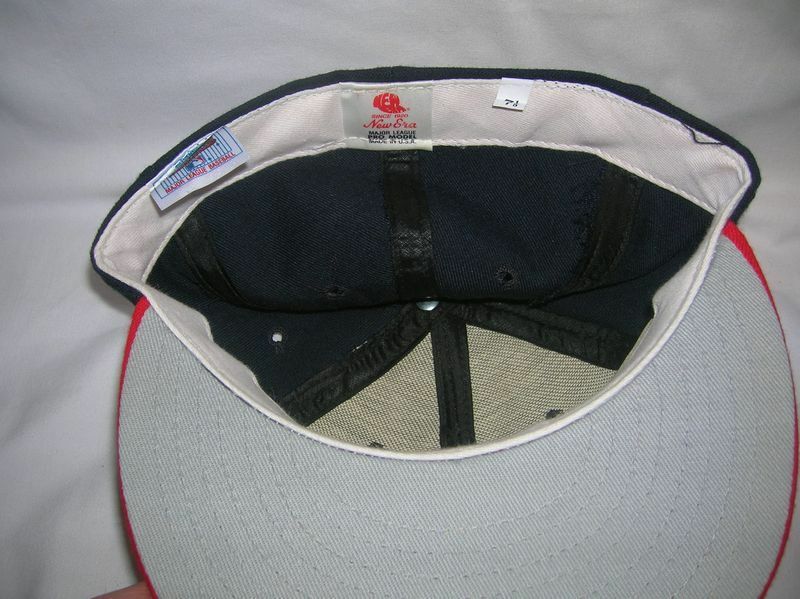 The cap below came from KM Pro inventory and has a Roman label. New Era caps had green under the brim at first. 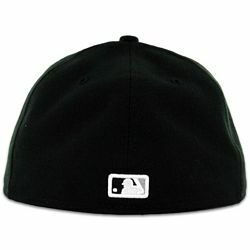 Player choice perhaps? 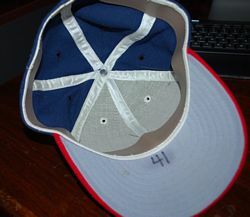 Time for a change. 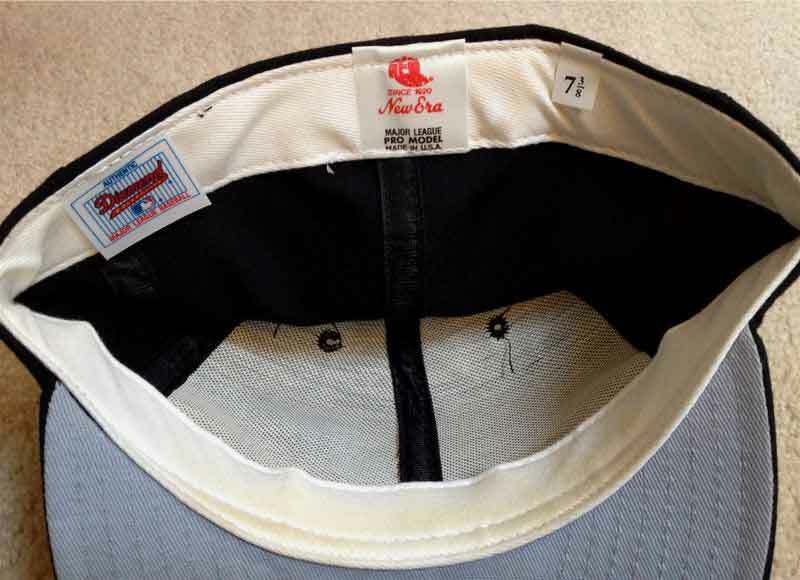 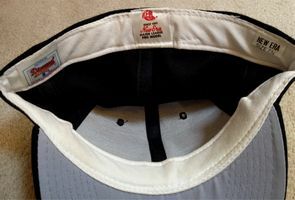 Home caps have nylon white front panels. Right on schedule the Sox switch to a look based on their 1942 set. 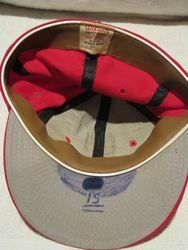 1990 sees the first Turn Back the Clock game. 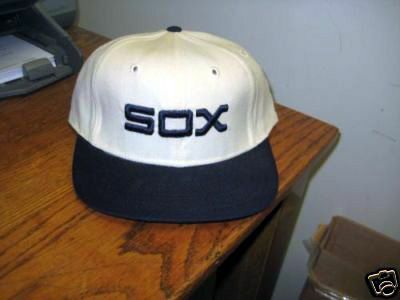 In order to keep baseball designers employed, a new look is ordered and introduced at the final homestand at old Comiskey Park in 1990. It's a return to a black look similar to 1949-63 but adding silver trim in place of red. 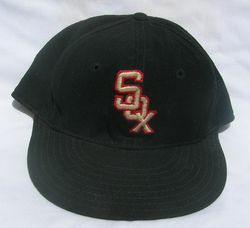 The logo is widened slightly in 1997. 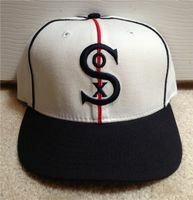 In honor of the American League's centennial in 2001, and as a charter member of the league, the White Sox wore throwback uniforms on Sundays based on their victorious 1917 World Series look. A 2006 Sunday alternate jersey is based on the Sox' 1906 look. Welcome to polyester and black undervisors. The Sox return to Sunday throwback jerseys. 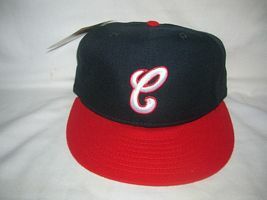 The 2012 alternate is the 1971-75 look. The 2013 Sunday alternate is the 1982-86 style. 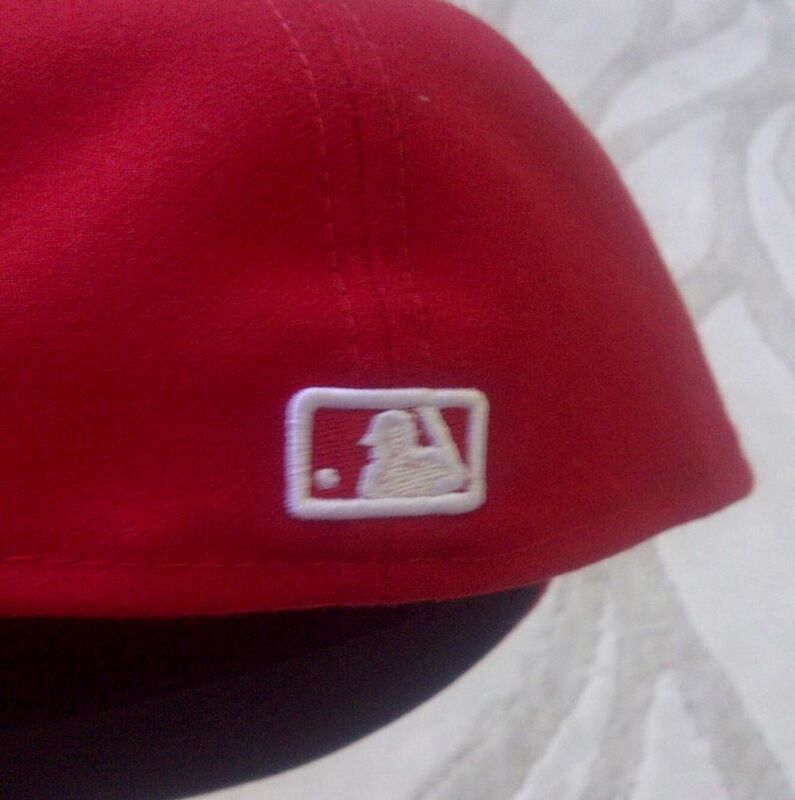 The red cap returns for one game. The Sox announce the throwback jersey will be used regularly and with the BP cap. 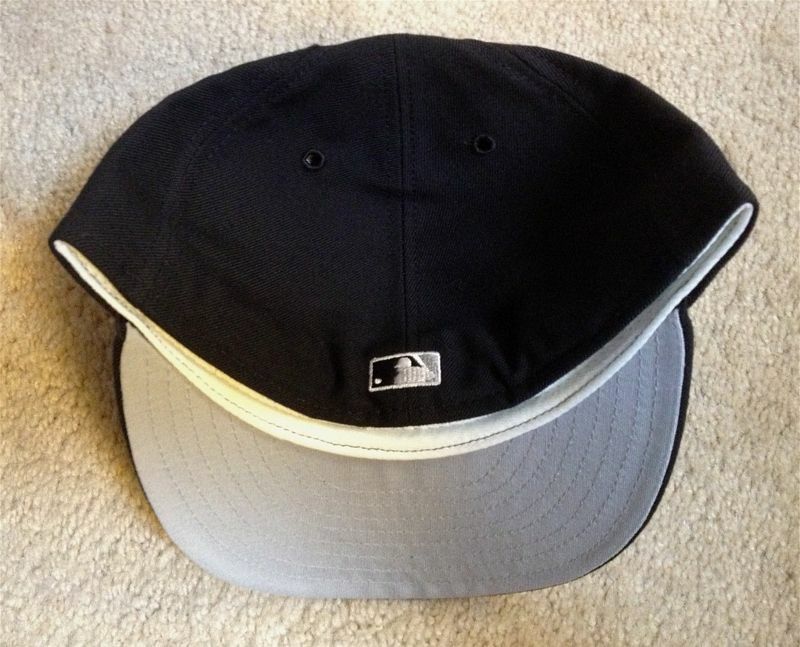 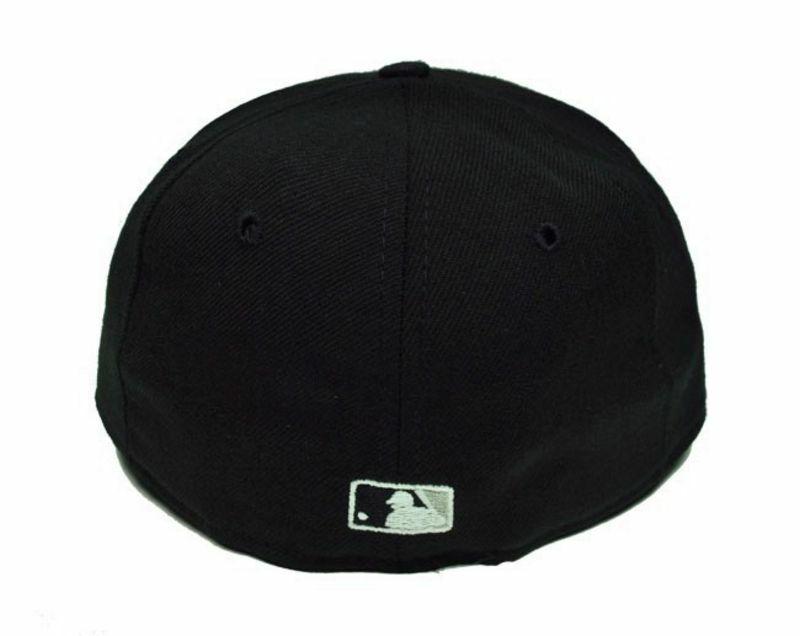 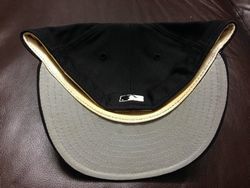 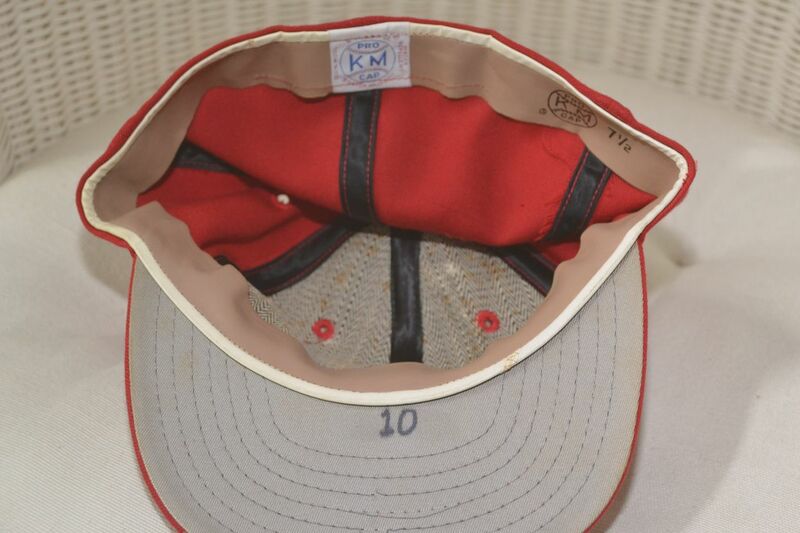 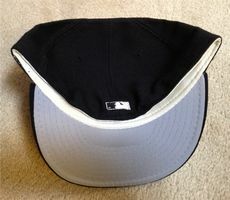 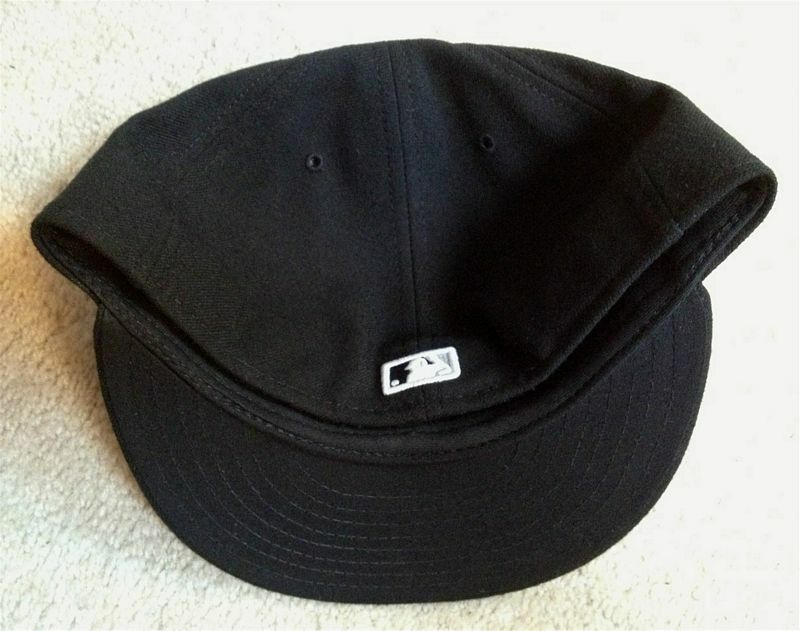 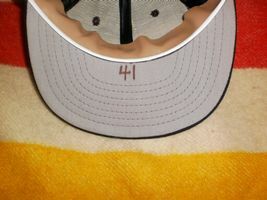 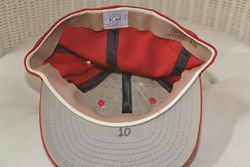 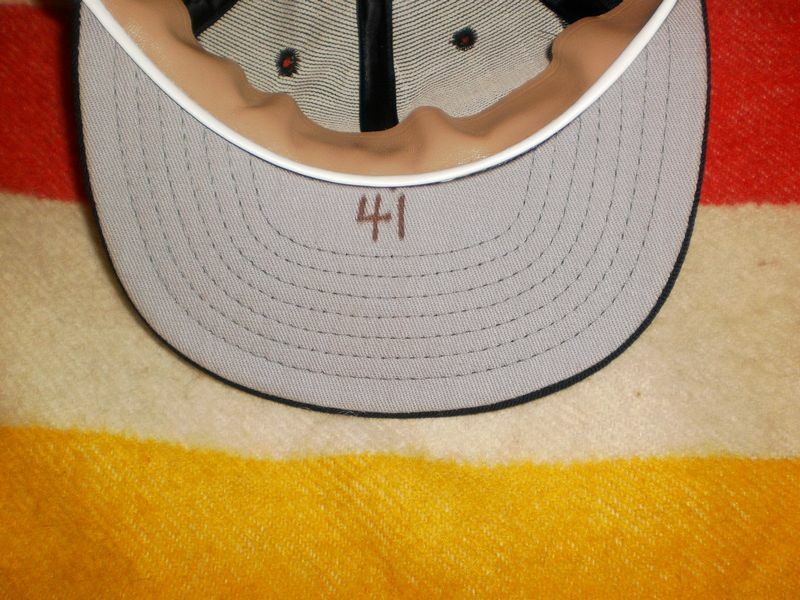 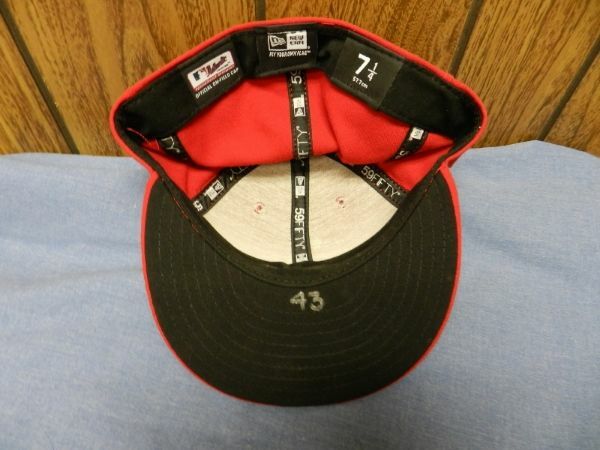 However the BP cap is only worn once. 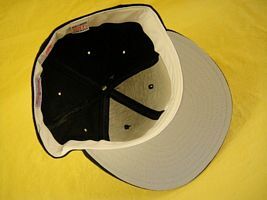 BP cap used just once.